Following OLED, notch design to LCD becomes a marketing trend in 2018? At the 6th China Information Technology Expo (CITE 2018) held in Shenzhen, Guangdong Province, China from April 8 to 11, 2018, a number of panel makers and set makers exhibited notch-designed display panels and smart phones. In CITE 2018, five panel manufacturers exhibited in CITE 2018; BOE, EDO, GVO, Tianma and CSOT. Among them, BOE, Tianma and CSOT exhibited notch-designed display panels. First, BOE introduced 6.2-inch OLED panels applied with notched design. 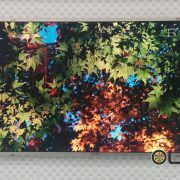 The OLED panel exhibited by BOE has a resolution of 2992 x 1440 with 537 ppi and 400 nit brightness. 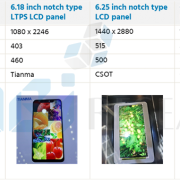 LCD panels also began to adopt Notch Design. 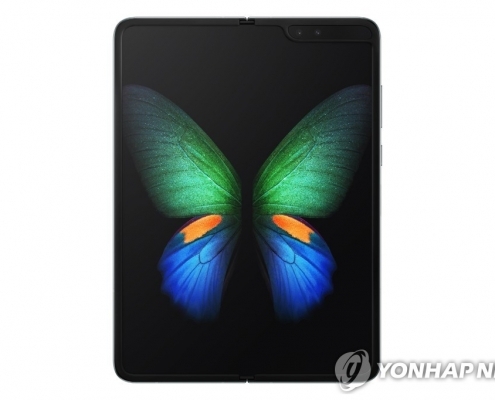 Tianma presented a 6.18-inch LCD panel with a notch design. 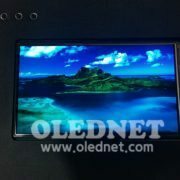 CSOT also exhibited two 6.25-inch LCD panels and a 6.18-inch LCD panel applied with notched design. 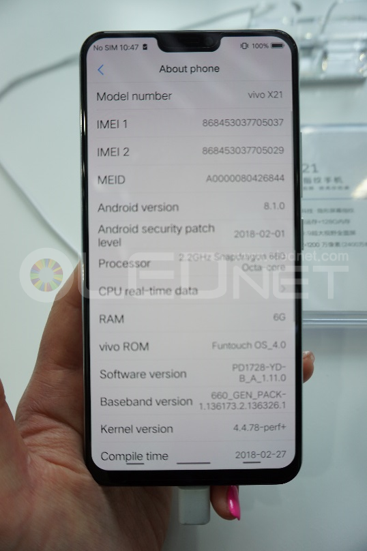 Vivo, a Smartphone maker, also exhibited the X21 with a notch design. The X21, released in March, has a resolution of 1080 x 2280 with 6.28 inch screen. Since Apple first unveiled its OLED smart phone with the notch design on iPhone X, a number of smart phone makers such as Vivo, Oppo, and Huawei have begun to release OLED smart phones. In this exhibition, many panel makers presented a large number of LCD panels to which Notch Design is applied. 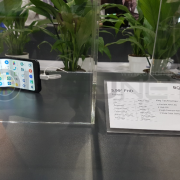 Attention is growing whether Notch Design can become a trend in the small and medium sized display market in 2018.
http://olednet.com/wp-content/uploads/2018/04/18041701.png 339 958 OLEDNET /wp-content/uploads/2015/09/logo_oled.png OLEDNET2018-04-18 14:29:512018-09-25 21:58:34Following OLED, notch design to LCD becomes a marketing trend in 2018? 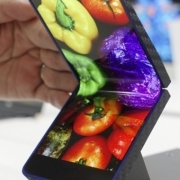 ■ Flexible OLED is expected to ship 480 million units in 2019, surpassing Rigid OLED shipments. 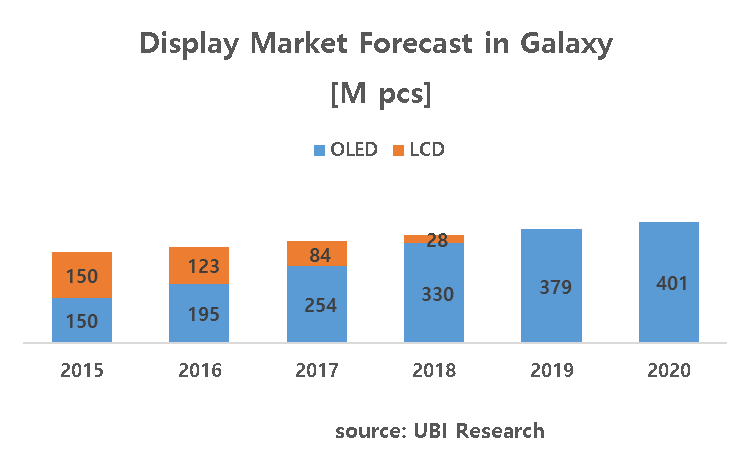 ■ Full-screen OLED among Flexible OLED is expected to have an average market share of 78.3% by 2022, dominating the market. 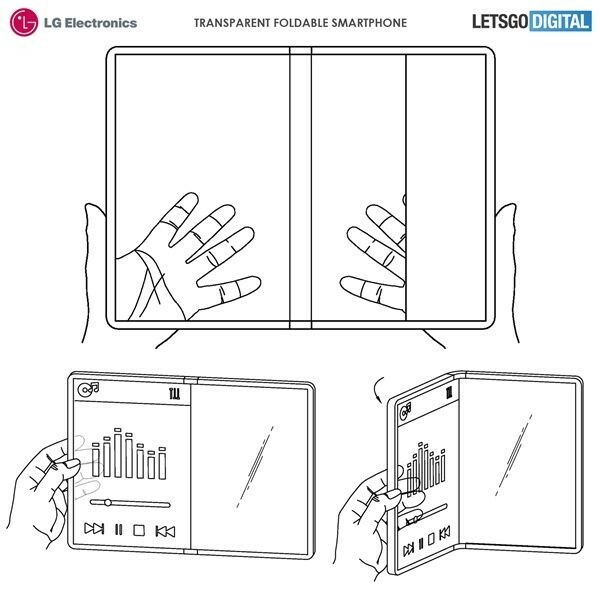 ■ Foldable OLED is expected to ship in earnest from 2019. Flexible OLED shipments are expected to exceed rigid OLED shipments in 2019. 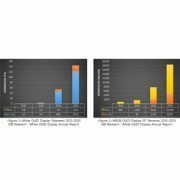 According to the ‘2017 Flexible OLED Annual Report’ published by Ubi Research, flexible OLEDs are expected to ship 480 million units in 2019, surpassing 409 million units of rigid OLED shipments. 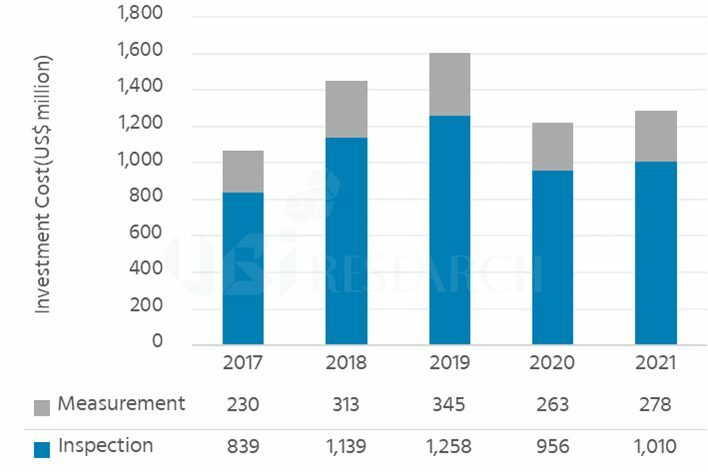 In addition, flexible OLED shipments will grow at a CAGR of 41% starting in 2018, reaching 1,285 million units in 2022 with forecasted revenue of US$ 59.4 billion. 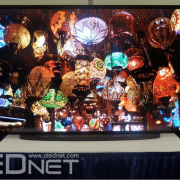 Recently, as the hardware technology of mobile devices has been leveled up, set makers targeting the premium market are trying to differentiate their products by adopting OLED. Especially, set makers are beginning to introduce flexible OLED capable of full screen, as the needs of consumers who want a wider screen in mobile devices (even in the same sizes) on the increase. Accordingly, panel makers are continuing to invest in flexible OLED mass production. Since Chinese panel makers such as BOE, CSOT and Visionox are expected to start mass production of Gen6 flexible OLED starting in 2018, flexible OLED shipments will likely grow at an average growth rate of 59% per annum, reaching 354 million units by 2022. 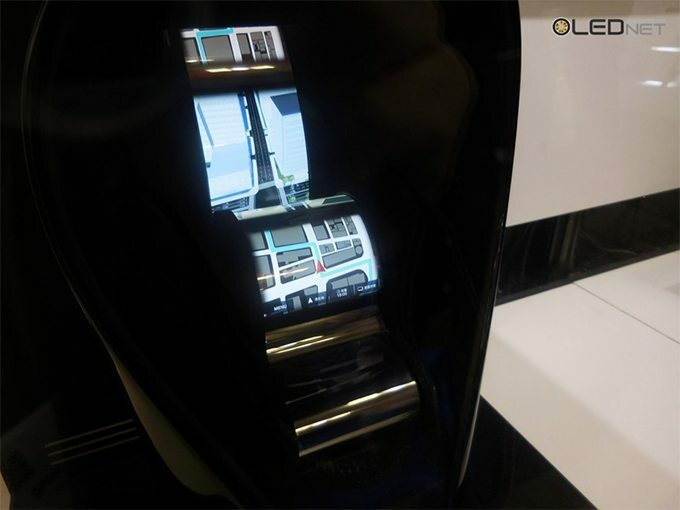 This report compares the structure and process of rigid OLED and flexible OLED, and analyzes the trends of technology development for foldable OLED implementation by layer. It also compares the flexible OLED application technology of Samsung Electronics, Apple, and LG Electronics which released mobile devices with full screen OLED. 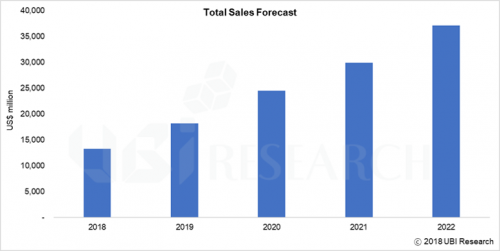 The report also forecasts the flexible OLED market from 2018 to 2022 by categorizing into various perspectives including flexible type, country and generation. 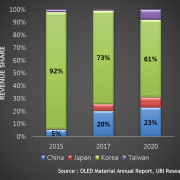 According to the report, full screen OLEDs of flexible OLEDs will ship 265 million units in 2018 with a market share of 82.1%, and 1,022 million shipments will be made in 2022, accounting for 79.5% of the market, leading the flexible OLED market. In addition, the foldable OLED, which has been receiving a great deal of attention recently, is expected to ship 5 million units from 2019 and 53 million units by 2022. 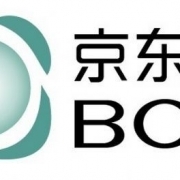 With the Google’s comments in 2015 that the new IoT era is coming, the 13th China International Display Conference started with the presentation of BOE, a large Chinese display company, with the topic of the era of smart interfaces to be developed in the future. 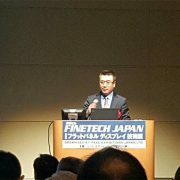 Randy Chen (BOE, Sales Marketing Executive) shared the overall IT market trend as the first presentation and delivered the BOE’s strategy within it. At the heart of the IOT industry, which is expected to account for around $ 10 trillion in 2050, smart interfaces that link 5G communications and electronics to displays will play a big role and emphasized 8K and flexible display as BOE’s survival strategy. 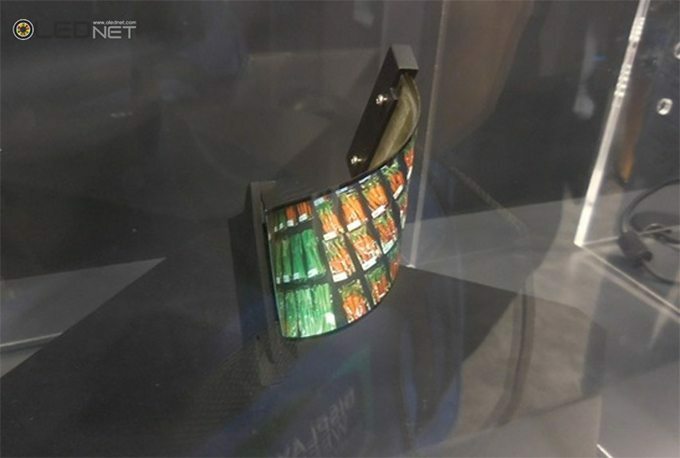 For this, he announced that they are working to build the 8K Industry Alliance and continuing to invest in the production of flexible displays starting with Chendu’s G6 Flexible Line. OLED panels produced in the Chendu B7 line, which began operating in the second half of this year, will be supplied to a smartphone maker in Shenzhen and expected to be seen in the market early next year. Next, Xiuqi Huang (GVO, Vice President) of Visionox, who first started producing OLEDs starting with PMOLED, mentioned the change of smartphone trend and said that a mobile device with a foldable and rollable type using a flexible panel will be introduced in the future. He said that the technological development is required not only in design but also in related equipment and materials and Visionox has also been actively developing its technology. 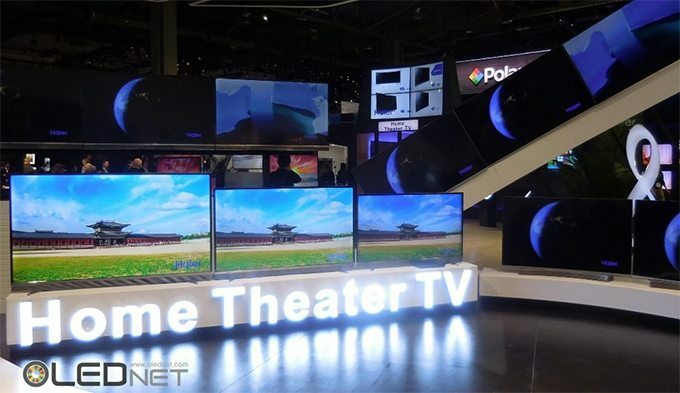 CSOT, which produces QD-LCDs together with Samsung Display, mentioned the development potential of QLED and OLED TV and said that it was spurring technological development and investment as a latecomer. Especially, it was developing large-area inkjet printing technology that has advantages of relatively high material utilization rate and price competitiveness, on the other hand, it shared the goal of developing a smartphone panel that minimizes Bezel. 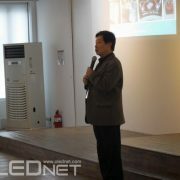 Following the presentation of representative panel companies in China, Lee Choong-hoon of Ubi Research, a global OLED research company, forecasted the market size of the OLED market, which is already leading the small-medium-sized panel market and the premium TV panel market and discussed why OLEDs have grown rapidly as a next-generation display. 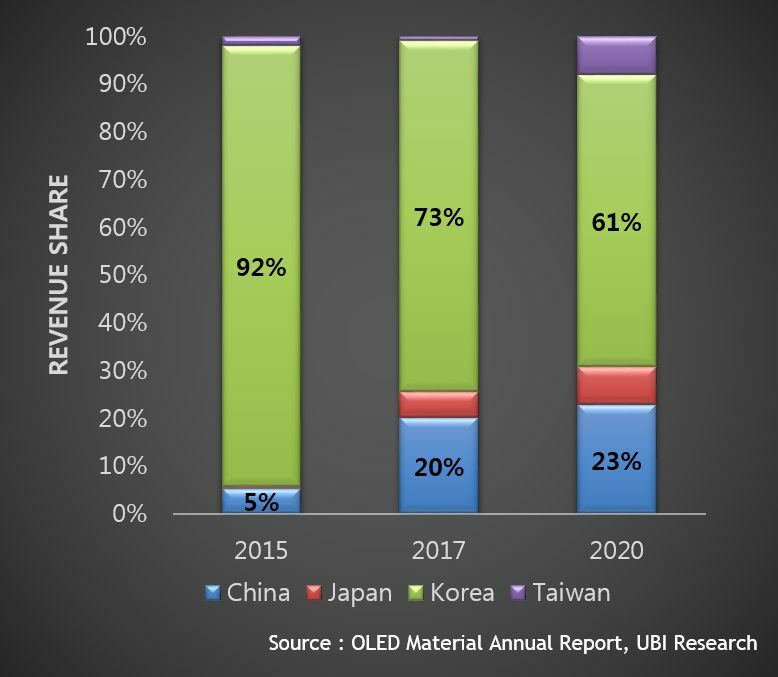 Ubi Research, as an OLED professional research company, is suggesting directions for future growth of OLED based on years of data and research experience. In current display industry, major global smartphone makers such as Apple, Samsung and Huawei already have plans to apply OLED to all flagship models and TV companies such as LG Electronics and Sony have also shown that OLED TVs can only succeed in the premium market. This is why we expect the development of various types of panels and various applications that maximize the advantages of OLED forward. China’s ZTE released its ‘AXON M’ last 17th. AXON M connected two 5.2-in HD LCDs hinged together to further enhance consumer convenience. According to ZTE official website, AXON M can be folded at various angles, and placed on a table with two users. US IT media CNET considered AXON M convenient as two applications may be run at once with one screen to play videos and another to check e-mails or Facebook. Sony, Kyocera, and other set makers have released similar smartphones. However, these have not received the spotlight in the market due to issues such as hinge and display durability, absence of exclusive apps, battery consumption, and such. ZTE installed Corilla’s 5th-Generation Gorilla Glass to enhance durability of smart phones, but AXON M shows to be continuously questioned on its durability due to its out-folding method (two displays folded outward), which is less durable than the in-folding method. In addition, despite the increase battery consumption of AXON M for large screen displays and such, its battery has a capacity of only 3,810 mAh. Considering a 5,000 mAh battery to be applied to the 5.5-in HD LCD on the ZTE Nubia N2 released last June, it is expected to have many consumers feel a lack of battery capacity in the AXON M.
The AXON M expands to 6.5 inches wide when opened using a hinge, but because there is a gap in the middle, it is difficult to call it a perfect foldable smartphone. As consumer needs for bigger screens increase, the developing speed of foldable smartphones is accelerating as well. At the SID 2017 in Los Angeles, US, AU Optronics and BOE have unveiled foldable displays under development. Both companies have folded one flexible OLED in a mechanical method, but the size and folding method were somewhat different (Au Optronics in 5-inch in-folding and BOE in 5.5 inch out-folding). With ZTE’s release, it is expected to have more intense competitions for market preoccupation for development of foldable smart phones. 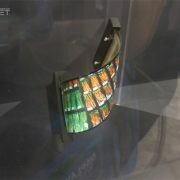 On the other hand, UBi Research is expected to start mass production of foldable OLED from 2019 through “Key issue and Market Analysis for Foldable OLED” Report published in 2016.
http://olednet.com/wp-content/uploads/2017/11/171101_AU_BOE-1.jpg 390 710 OLEDNET /wp-content/uploads/2015/09/logo_oled.png OLEDNET2017-11-06 12:52:422018-09-25 22:50:19First Foldable Smartphone Title, Who will take it? 지난 17일 중국 ZTE는 ‘AXON M’을 공개했다. AXON M은 5.2 inch HD LCD 2장을 경첩으로 연결시켜 소비자의 편의성을 더욱 확대시켰다. 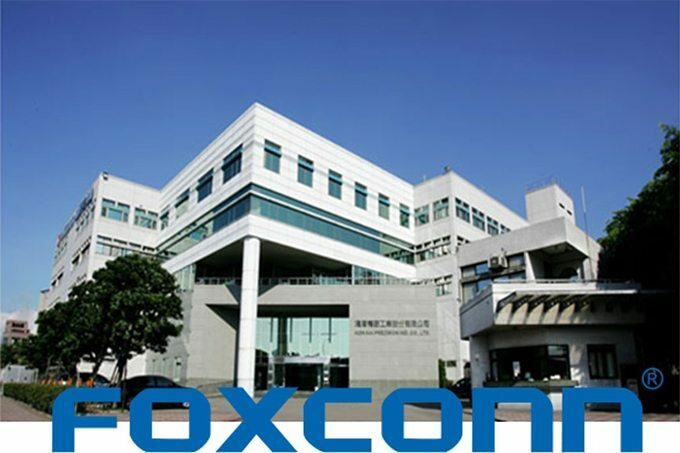 ZTE 공식 홈페이지에 따르면, AXON M은 여러 각도로 접어서 사용할 수 있으며, 테이블 위에 세워 두고 두 명이 사용할 수도 있다. 미국 IT매체 씨넷은 AXON M에 대해 한 화면에서는 동영상을 재생하고 또다른 화면에서는 이메일을 확인하거나 페이스북을 이용하는 등 두개의 앱을 한꺼번에 실행하여 편리하다고 평가했다. 그간 소니, 교세라 등 여러 set 업체에서 유사한 형태의 스마트폰을 출시한 바 있다. 그러나 경첩 부분과 디스플레이의 내구성, 전용 앱의 부재, 배터리 소모 등의 이슈가 있었기 때문에 시장에서 각광받지 못했다. 이에 따라 ZTE는 스마트폰의 내구성을 향상시키기 위해 corning사의 5세대 Gorilla Glass를 탑재하였다. 하지만 AXON M은 in-folding 방식 대비 내구성이 취약한 out-folding 방식(두 개의 디스플레이가 바깥쪽을 향하게 접는 방식)이 적용되어 내구성에 대한 의문은 지속적으로 제기될 것으로 보인다. 또한, AXON M은 대화면 디스플레이 등 배터리를 소모하는 요소가 늘었음에도 불구하고 배터리 용량은 3,810 mAh에 불과하다. 지난 6월 ZTE가 출시한 ZTE nubia N2에는 5.5 inch HD LCD와 용량이 5,000 mAh인 배터리가 적용됨을 감안해볼 때, AXON M의 배터리 용량 부족을 느끼는 소비자가 많아질 것으로 예상된다. 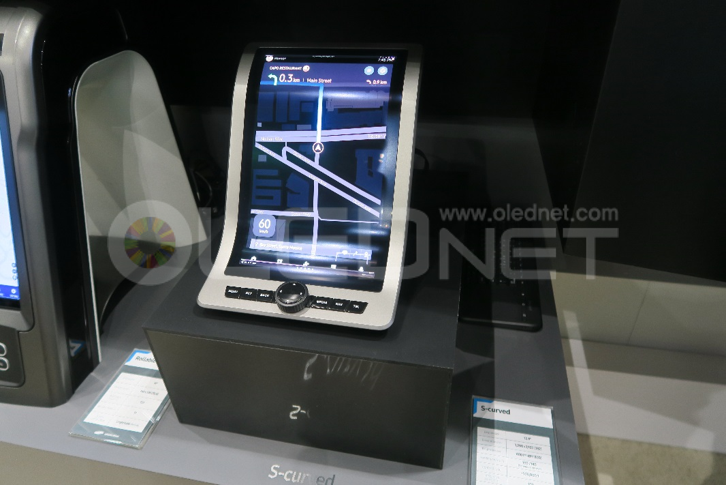 AXON M은 경첩을 이용하여 폈을 때는 6.75 inch 대화면이 되지만, 가운데에는 틈이 존재하여 완벽한 foldable 스마트폰이라 말하기에는 어렵다. 최근 대화면에 대한 소비자 니즈가 나날이 증가함에 따라, 접었다 펼 수 있는 foldable 스마트폰 개발에 속도가 붙고 있다. 미국 로스앤젤레스에서 열린 SID 2017에서 AU Optronics와 BOE 는 현재 개발중인 foldable 디스플레이를 공개한 바 있다. 두 업체 모두 1장의 flexible OLED를 기계적인 방식으로 folding하였으나, 크기와 folding 방식에서 다소 차이가 있었다(Au Optronics는 5 inch in-folding방식, BOE는 5.5 inch out-folding방식). 또한, 지난 20일 삼성전자가 특허청에 다관절 힌지를 이용하여 한쪽이 휘는 형태의 ‘플렉서블 전자 장치’라는 특허를 제출하였으며, Galaxy Note8 출시 간담회에서 고동진 삼성전자 사장은 “내년 무선사업부 로드맵에 foldable 스마트폰이 포함되어 있다”고 언급한 바 있다. ZTE의 이러한 행보를 기점으로 진정한 의미의 foldable 스마트폰 개발과 시장 선점 경쟁은 더욱 치열해 질 것으로 예상된다. 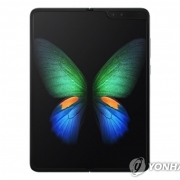 한편, 유비리서치는 2016년 발간된 “Key issue and Market Analysis for Foldable OLED’ 보고서를 통해 foldable OLED는 2019년부터 본격적으로 양산이 시작될 것으로 예상했다. How about the future OLED market performance? 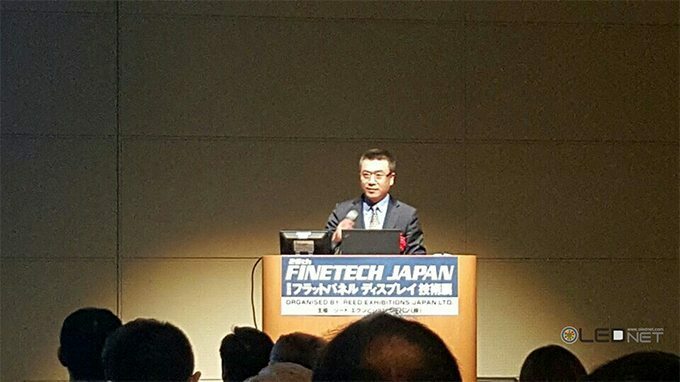 At the seminar titled “OLED market analysis and the latest technology” host by the UBI Research at the FKI last June, the president, Lee Choong Hoon predicted the market through analyzing the OLED industry investment and mass production in the first half of 2017. President Lee Choong Hoon emphasized that China will lead the OLED equipment market by 2021 due to increase in OLED demand of Chinese set makers. Accordingly, the Chinese equipment market is expected to account for about 48% of the entire equipment market in 2021, investing approx. US $ 40.5 billion. 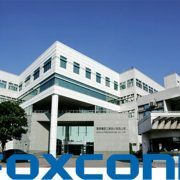 It is anticipated that such movement of Chinese companies will affect the OLED smartphone market. In 2019, OLED smartphones will reverse the LCD smartphone market, accounting for 80% of the total smartphone market by 2021. On the other hand, as for the flexible OLED, between 2017 and 2019, Samsung Electronics expects to invest heavily in BOE to be ranked second in the flexible OLED market, which should cope with the increasing demand on flexible OLED of Samsung Electronics and Apple. President Lee analyzed that the premium TV market will be formed with larger than 65 inches as the 65-inch panels will be mass-produced at BOE’s Gen10.5 LCD plant from 2018. Consequently, panel makers without Gen10.5 will produce 65 inch panels on the Gen8 line in MMG (multi-model on a glass) method. On the other hand, LG Display is expected to continually produce TV OLED panel at Gen8, and since 2020 at Gen10.5 line. According to ‘2017 OLED Manufacturing Equipment Annual Report’ published by the UBI research, from 2017 to 2021, it is anticipated that TFT equipment will account for 45% of the market share, followed by OLED pixel forming equipment 17%, encapsulation equipment 13%, cell equipment 13% and module equipment 12% respectively. 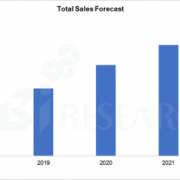 As the demand on flexible OLEDs is expected to increase remarkably in the future, the market share of cell and module equipment will accordingly increase by 25% with high importance. http://olednet.com/wp-content/uploads/2017/07/170704_1_logo-e1499654839875.jpg 380 600 OLEDNET /wp-content/uploads/2015/09/logo_oled.png OLEDNET2017-07-03 17:25:552018-09-26 20:14:02How about the future OLED market performance? 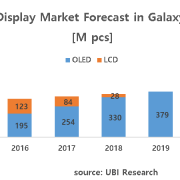 ■The OLED equipmentmarket is expected to reach $84.9 billion in 5 years. ■Korean and Chinese panel companies will take over 90% of investment in panel equipment. According to ‘2017 OLED Manufacturing Equipment Annual Report’ published by UBI Research, the entire equipment market of OLED is expected to total$84.9 billion(about 93trillion KRW) from 2017 to 2021. 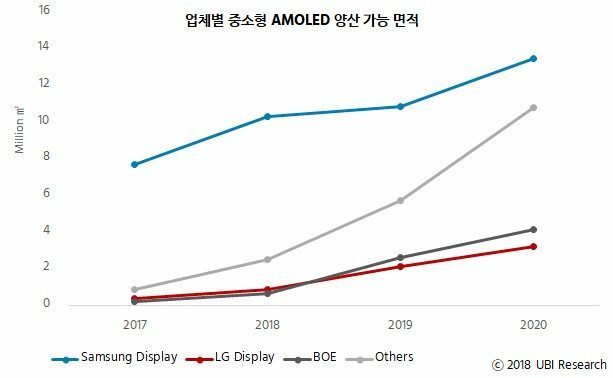 In 2017, $16.4 billion(about 18 trillion KRW) will be invested in OLED equipment. The OLED equipment for the market analysis is largely categorized by process into 5 kinds of equipment; TFT, OLED, encapsulation, cell, and module. The investment costs including distribution equipment and test equipment of each process are calculated, and touch-related equipment is excluded from the market analysis. Hyun Jun Jang, a senior researcher of UBI Research forecasts that the two countries will lead the OLED market due to the massive investment from both Korean panel companies occupying the OLED industry and latecomers Chinese panel companies. According to this report, China and Korea will actively invest in OLED equipment from 2017 to 2017, showinga 48% and a 42% OLED market share, respectively. In particular, the two countries are expected to make the largest investment of $32.8 billion(about 36 trillion KRW) in 2017 and 2018. Samsung Display has been expanding small and medium OLED lines to be applied to Galaxy series and Apple, and LG Display has been investing in both small & medium and large-size OLED lines. China’s BOE and CSOT are likely to invest heavily in OLED line because especially BOE has decided to invest more than 30K in small and medium OLED lines every year since 2017. 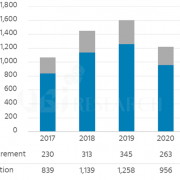 From 2017 to 2021, itis forecast that TFT equipment, OLED pixel patterning equipment, encapsulation equipment, cell equipment, and module equipment will have a 45%, 17%,13%,13%, and 12% market share, respectively. 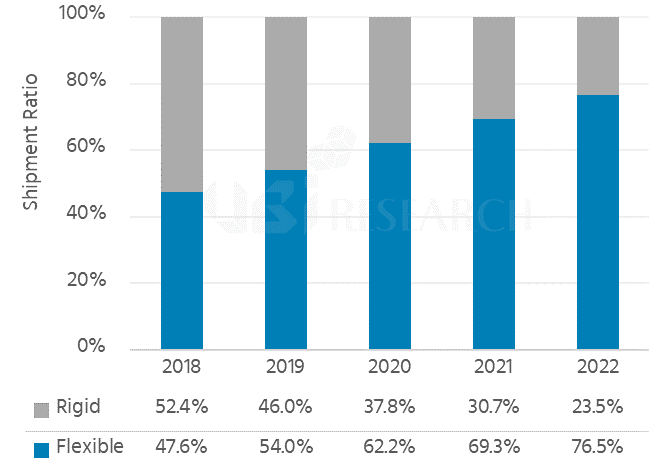 In near future, the demand for flexible OLED will be likely to increase so that cell and module equipment will gain more importance having a 25% market share. CITE 2017(China Information Technology Expo) was held in Shenzhen, China from April 9 to 11. As the Asia’s largest electronic and information exhibition hosted by the ministry of industry and information technology of the people’s republic of China and the local government of Shenzhen, the 5th CITE 2017 is the international IT event in which 1,600 companies participate annually, with 160,000 visitors. 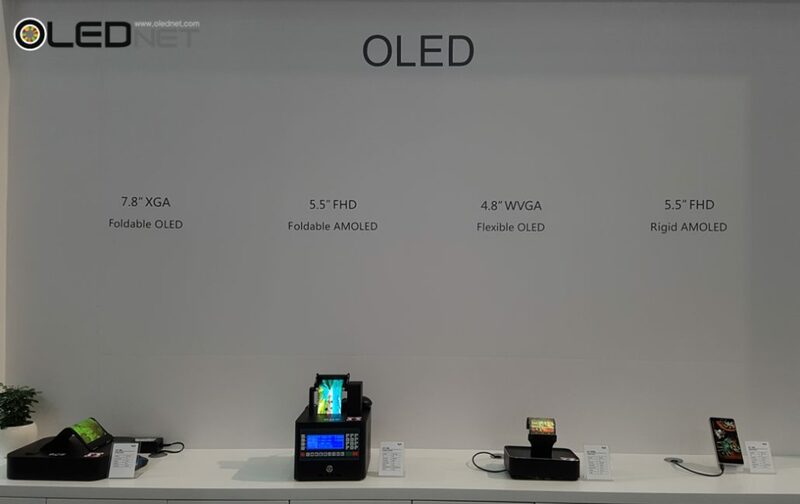 At this expo, LG Display, BOE, CSOT, and Tianma exhibited OLED panel on one hand, and Changhong, Hisense, Konka, and Skyworth unveiled OLED-applied products on the other hand. 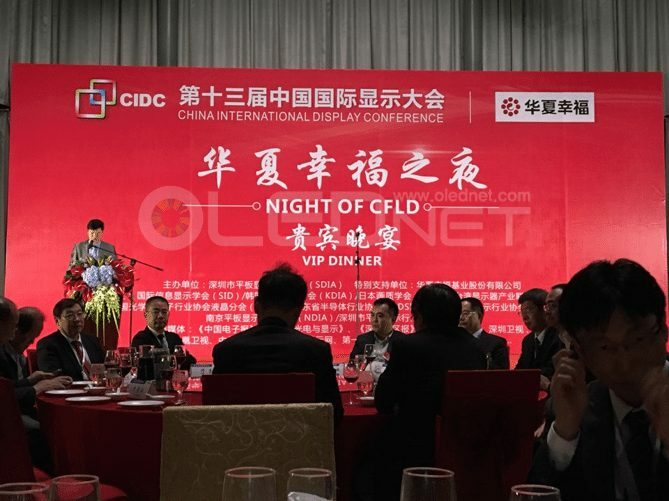 Besides, many companies including Jilin OLED operated a shared exhibition hall under the name of China OLED Industry Alliance(COIA). LG Display, the only large-area OLED panel manufacture unveiled its flagship 65-inch UHD Wall Paper OLED with an ultrathin and ultralight design of 3mm thickness and 7Kg weight, and Crystal Sound OLED displaying itself as a speaker. LG has received CES 2017 Innovation Award for its technology of Wallpaper TV OLED panel. Besides, LG Display showcased various products applying OLED including OLED Pillar with six 77-inch UHD OLED panels and Dual-view flat with two 77-inich UHD OLED panels, while unveiling a 12.3-inch curved OLED for automobiles, two kinds of smartphones, and two kinds of plastic OLEDs for watches. 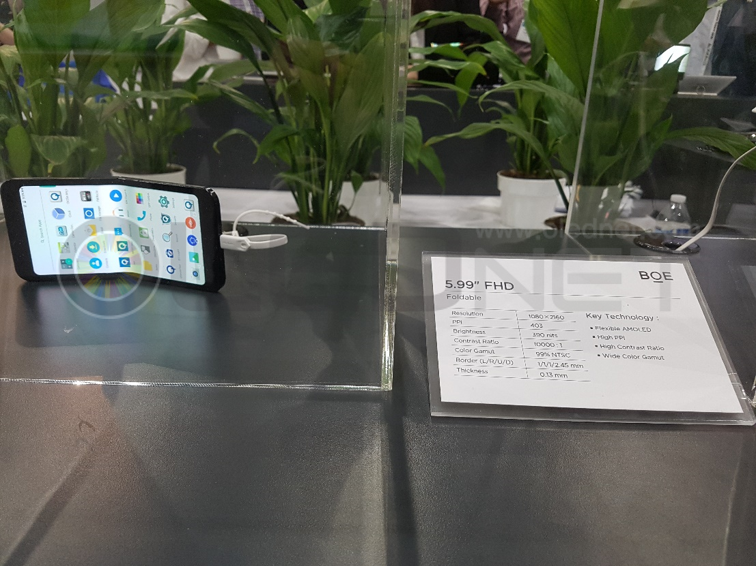 A Chinese OLED panel company, BOE boasted of its technology, demonstrating a 7.9-inch foldable OLED, a 5.5-inch edge bended OLED, and a 1.39-inch rounded OLED. The other OLED TV set companies are all Chinese companies such as Changhong, Hisense, and Skyworth. 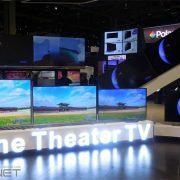 They exhibited its flagship 65-inch OLED TV, a key size of premium TVs. Hisense exhibited the smartphone with OLED panel and e-ink panel on its both sides as well as OLED TV. BOE signed an agreement with a Hefei municipal government to co-invest 1 billion CNY (around $145 million USD) on feb 6, 2017 to establish a new OLED TV Production Line in Hefei, China. 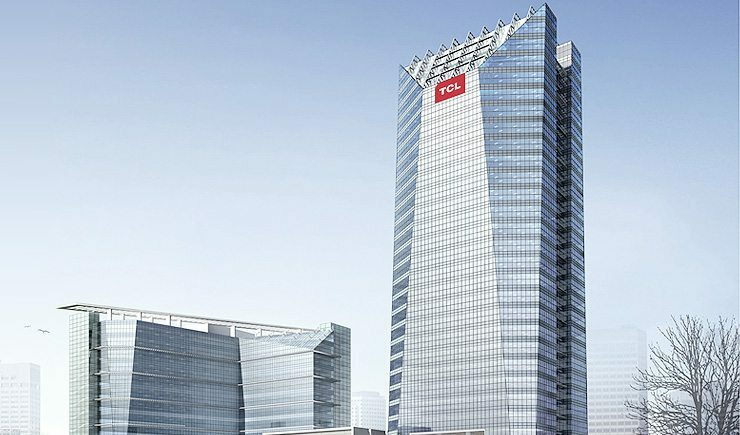 According to the agreement, BOE will invest 80% of the funds, and the rest will be provided by the Hefei municipal government, and the project company will be located in Anhui province. The detailed schedule or production size has not been informed yet. Meanwhile, BOE that is manufacturing a small quantity of OLED TV panels in a Gen8 pilot line in Hefei is expected to build an OLED technology platform including printing and form an OLED industry chain through this project. BOE unveiled 55inch FHD WRGB OLED TV prototype at SID 2014 and Skyworth’s 55inch UHD OLED TV with 55inch UHD OLED Module at ‘The 18th China High-Tech Fair’ held in nov 2016, garnering a lot of attention. 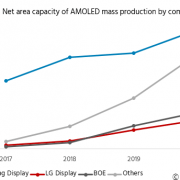 There’s a keen interest on how BOE’s investment influence the large-sized OLED panel market that is being led by LG Display, through this investment. BOE가 현지시간으로 2017년 2월 6일, Hefei의 새로운 OLED TV 생산 라인 설립을 위해 Hefei시 정부와 10억 CNY(약 145 million USD) 규모의 공동 투자 계약을 체결했다. 계약서에 따르면, BOE는 자금의 80 %를 투자하고 나머지는 Hefei 정부에 의해 제공되며, 프로젝트 회사는 Anhui성에 위치 할 것으로 보인다. 일정이나 생산 규모에 대한 정확한 내용은 아직 알려지지 않았다. 현재 Hefei의 Gen8 파일럿 라인에서 소량의 OLED TV용 panel을 제조하고 있는 BOE는, 이번 프로젝트를 통해 printing을 포함한 OLED 기술 플랫폼을 형성하고 OLED 산업 체인을 구성할 것으로 기대를 모으고 있다. 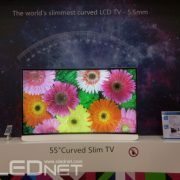 BOE는 지난 SID 2014에서 55inch FHD WRGB OLED TV prototype을 공개한 바 있으며, 지난 2016년 11월 개최된 ‘제 18회 중국 하이테크페어’에서는 55inch UHD OLED Module이 적용된 Skyworth의 55inch UHD OLED TV를 전시하여 큰 화제를 모았다. 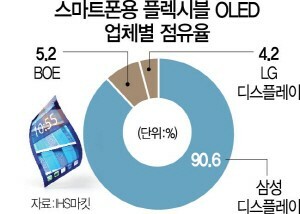 이번 투자를 통해, 현재 LG Display가 주도하고 있는 대면적 OLED panel 시장에서 BOE가 어떠한 영향을 미칠지 귀추가 주목되고 있다. 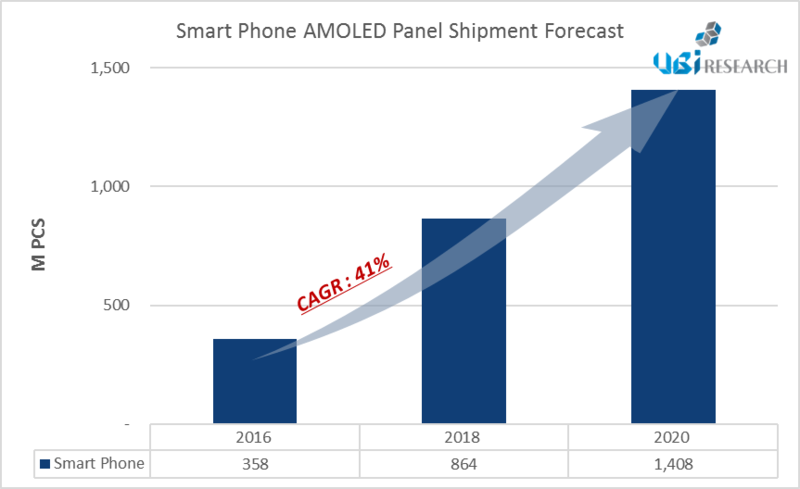 According to UBI Research, the shipment amount of AMOLED panel for smart phones in the 3rd quarter of 2016 was announced to be counted as 96million units. It is the figure increased for 103% compared with the last quarter, and increased for 148% compared with the same period of last year, and it renewed the quarterly highest shipment amount once again, after the last quarter. Currently, Samsung Display occupies more than 91% of the AMOLED panel market for smart phones, and Chinese panel makers such as BOE, EDO, Tianma, and Visionox are conducting mass production with small quantities. In addition, Apple is expected to apply the flexible AMOLED panel to some models of the iPhone to be launched in 2017, therefore, future AMOLED panel market for smart phones will be increased continuously. 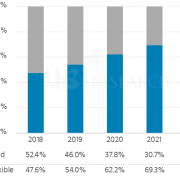 UBI Research expects that the annual shipment amount of AMOLED panel will form the market volume as about 1.4billion units by 2020 with the average annual growth rate of 41%, and flexible AMOLED panel among them will account for about 61%. In ‘18th China High- Tech Fair,’ BOE collected a big topic by exhibiting 55” UHD OLED TV of Skyworth to which 55” UHD OLED Module was applied. 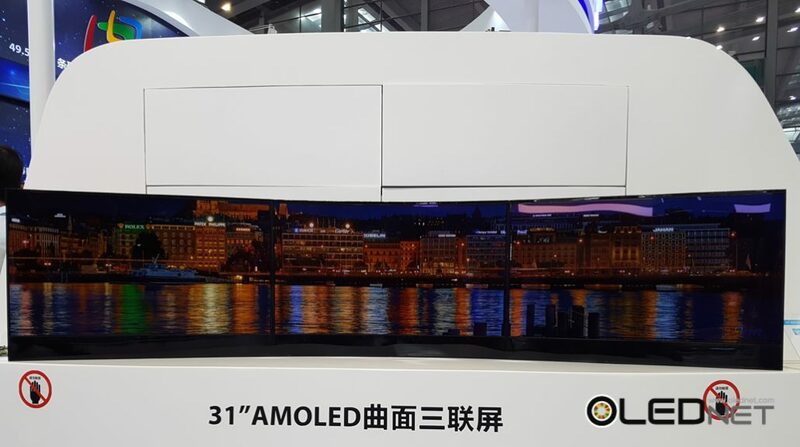 CSOT also publicized 31inch curved FHD OLED panel this time even though they have exhibited 31inch FHD OLED panel in the past. About 80inch was realized by attaching 3 Curved OLED panels, and resolution was 5760*1080 along with 150nits brightness. Two enterprises manufactured the product together by applying WRGB+CF structure having been produced massively in LG Display. In this exhibition, BOE and CSOT became to have first tile in Chinese enterprises with 55inch UHD OLED and 31inch curved OLED, and it is expected that it could be new drive of WRGB OLED panel market afterwards. 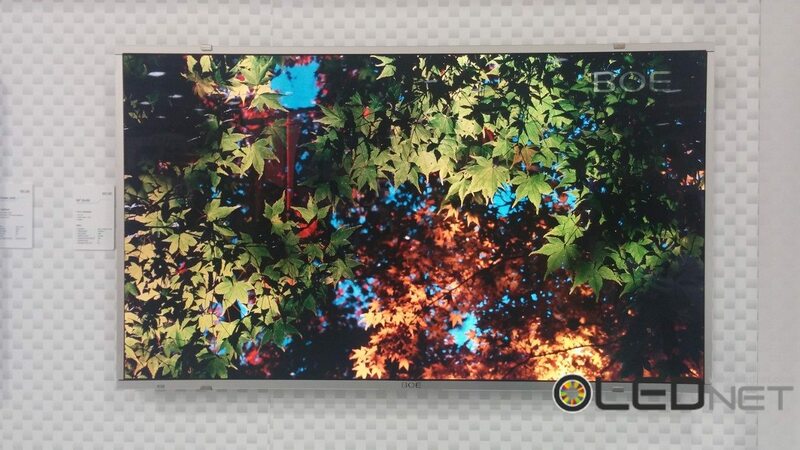 BOE and CSOT are manufacturing the panel for OLED TV in Gen8 pilot line of Hefei and Gen4.5 R&D line of Shenzhen, China respectively, and two enterprises are under positive consideration about large-scale OLED mass production lines. 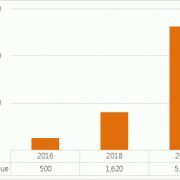 Currently LG Display possesses mass production lines uniquely in relation with large-scale OLED panel market, and is leading OLED panel market alone. In future, BOE and CSOT are expected to join in large-size OLED panel market, and it is anticipated that market expansion through competitions in large-size OLEF panel market could be made. 46.5 billion yuan(about 7.8 trillion KRW) in Gen6 flexible AMOLED production line. BOE plans to begin construction in December 2016 and produce the items from 2019, and its capacity is 48K per month. It is expected to be used for producing high-end smartphones. 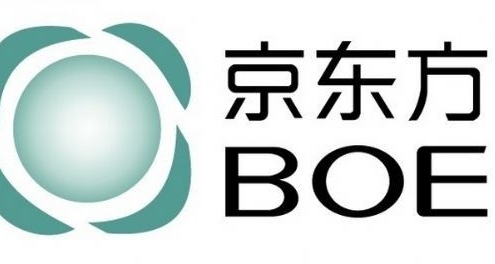 BOE is carrying out 45K investment in Gen6 flexible AMOLED in Chengdu, and as part of this extension it is scheduled to put additional investment. The investment in OLED has accelerated recently. 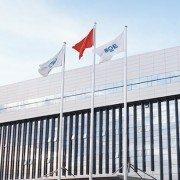 Chinese panel companies including Visonox and EDO as well as BOE have decided to put investment in the production line of Gen6 flexible AMOLED panel and establish more lines. BOE’s Gen6 flexible AMOLED panel production line where the investment has been decided or is still ongoing accounts for 75% of 120k that is total capacity of A3 Line, Gen6 flexible AMOLED production line of Samsung Display. If other Chinese panel companies’ investment that has been already decided or is ongoing is combined together, the investment exceeds Korea’s flexible AMOLED panel production capacity, even allowing for Samsung Display and LG Display’s additional investment. With China’s active investment in flexible AMOLED panel production line, Chinese AMOLED panel market is expected to grow rapidly. 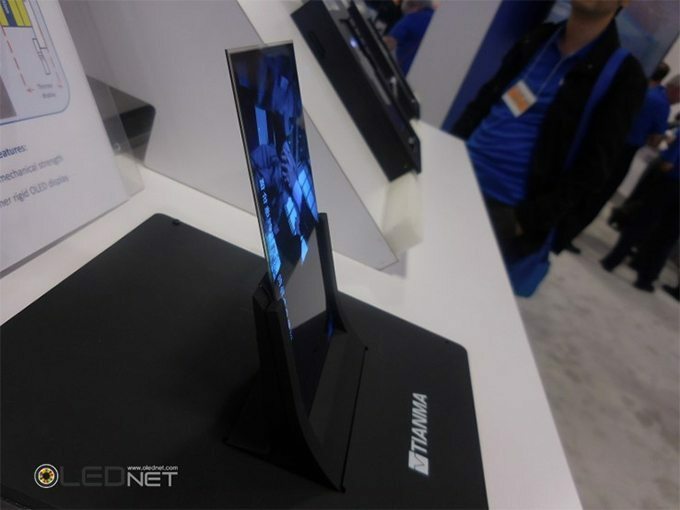 During the SID 2016, not only Samsung Display and LG Display, but other companies including BOE, Japan Display (JDI), and Tianma also presented OLED. The extent of OLED by Korea, China, and Japan drew much attention. In SID 2016 (22-27 May), these companies exhibited many new OLED panels for diverse devices such as smartphone, VR, and TV. Samsung Display revealed rollable panel, diverse 5 inch level OLED panel products such as VR panel with 806 ppi, the highest value within the industry, and Bio Blue, a VR panel which minimized harmful blue light. LG Display showed 77 inch UHD OLED panel for TV, 55 inch dual side panel for signage, 65 inch concave OLED, and demonstrated their strength as the leader in large size OLED panel. 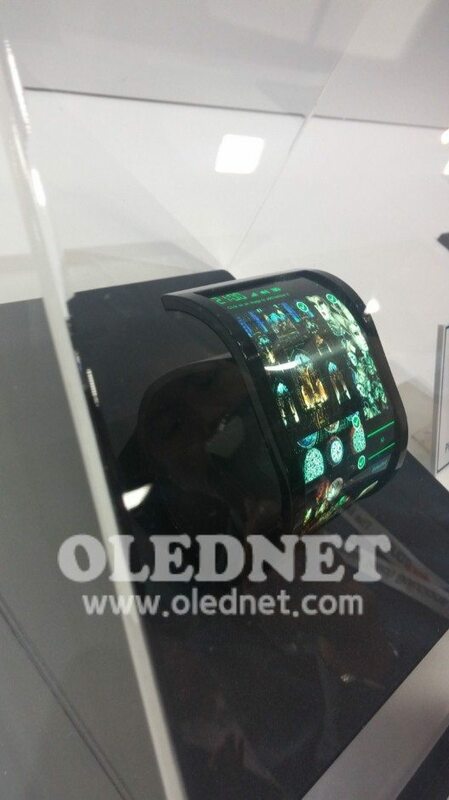 At this exhibition, BOE revealed flexible OLED display for mobile device. Particularly, the 4.35 inch foldable panel is BOE’s first. The product’s bending radius of 5 mm and has the brightness of 350 nits. 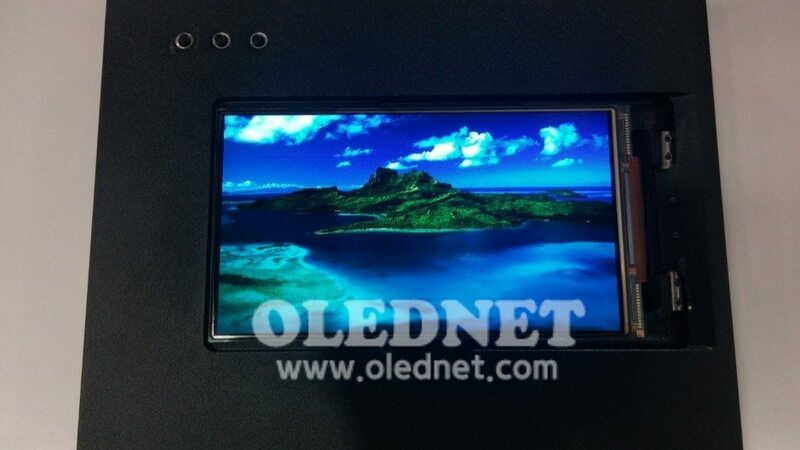 Tianma displayed 55 inch on-cell touch equipped TFT-HD AMOLED panel. 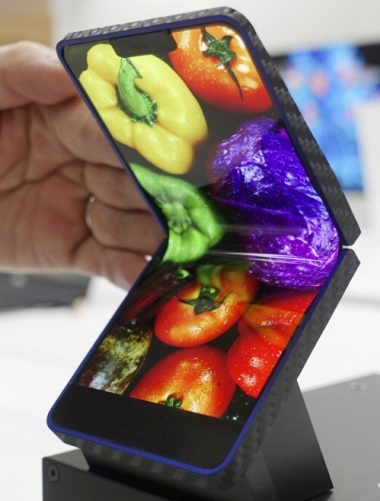 The flexible display has 270 ppi and bending radius of 20 mm. JDI exhibited flexible plastic OLED (POLED). The 5.2 inch product has 423 ppi with the resolution of 1080 x 1920. 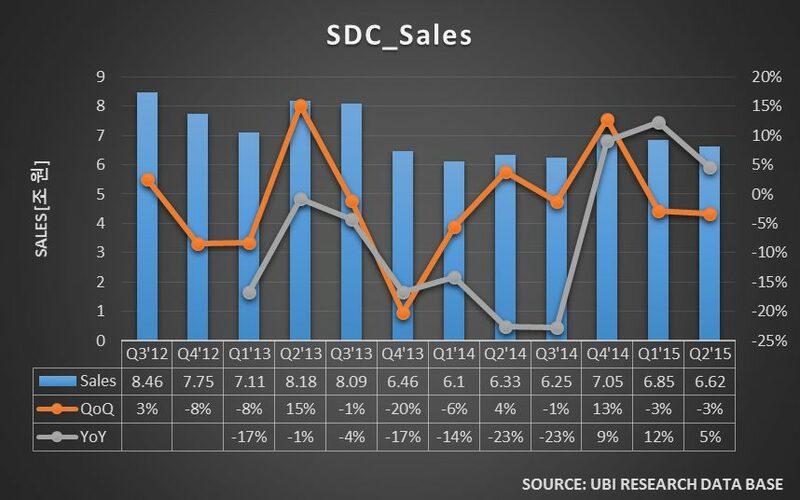 Quantum dot sector also presented a strong front against OLED in SID 2016. Nanosys and QD Vision exhibited OLED TV and quantum dot TV next to each other and presented merits of quantum dot. According to QD Vision, quantum dot could consume 50% less power compared to OLED. 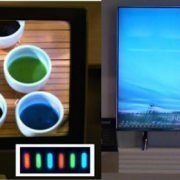 Nanosys explained that while white OLED panel TV shows brightness of only up to 500 nits, their own quantum dot TV can actualize 1,200 nits of brightness. 올해 ‘SID 2016’에서는 삼성디스플레이, LG디스플레이 뿐 아니라 BOE , 재팬디스플레이(JDI) , 티안마 등도 OLED를 선보여 한, 중, 일의 OLED 공세가 관심을 끌었다. 지난 5월 22일부터 27일까지 미국 샌프란시스코 모스콘 컨벤션센터에서 개최된 ‘SID(Society for Information Display, 국제 정보디스플레이 학회) 2016’에서 이 업체들은 스마트폰, VR, TV 등 다양한 기기를 위한 OLED 패널 신제품들을 대거 선보였다. 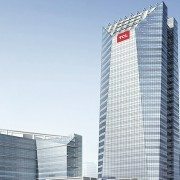 삼성디스플레이는 롤러블 패널 및 업계 최고 수치인 806ppi의 VR용 패널 및 블루파장을 최소화한 VR용 ‘바이오블루’ 등 다양한 5인치대 OLED 패널 신제품들을 전시하며 눈길을 끌었다. 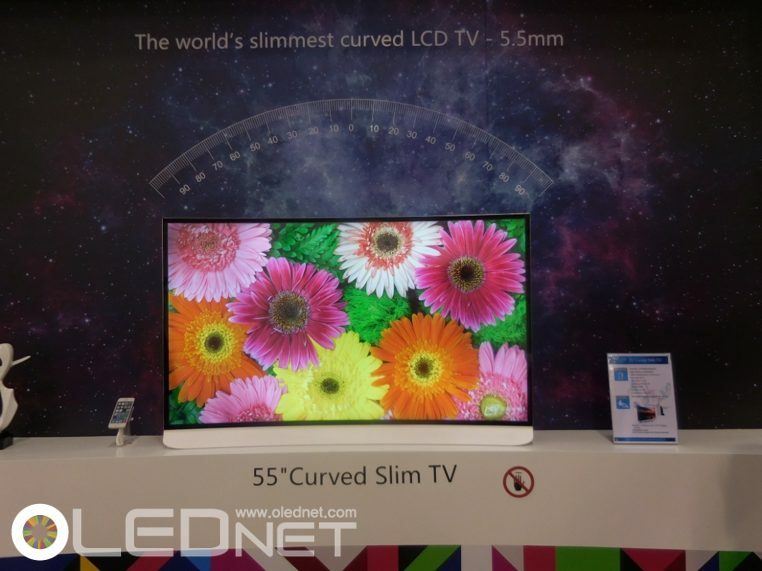 LG디스플레이는 77인치 TV용 UHD OLED 패널, 사이니지용 55인치 양면 및 65인치 오목(Concave) OLED 등을 선보이며 대형 OLED 패널 최강자의 면모를 과시했다. BOE도 이번 전시에서 모바일용 플렉서블 OLED 디스플레이를 선보였다. 특히 4.35인치 폴더블 패널을 공개한 것은 이번이 처음이다. 이 제품은 5mm의 밴딩 반경(bending radius)을 갖췄으며 밝기는 350nit다. 티안마도 5.5인치 온셀터치 기술이 적용된 TFT-HD AMOLED 패널을 전시했다. 이 패널은 270ppi의 플렉서블 디스플레이로, 밴딩 반경은 20mm이다. JDI는 플렉서블 플라스틱 OLED(POLED)를 전시했다. 5.2인치의 이 제품은 423ppi며 1080×1920의 해상도를 갖췄다. 한편 이번 전시회에서는 OLED에 맞서 퀀텀닷 진영의 공세도 만만치 않았다. 나노시스와 QD비전은 OLED TV와 퀀텀닷 TV를 나란히 전시하며 퀀텀닷의 장점을 내세웠다. QD비전에 따르면 퀀텀닷이 OLED보다 전력소모가 최대 50% 적다. 또 나노시스는 화이트OLED 패널 TV가 500니트의 밝기에 불과하지만 자사 퀀텀닷 기반 TV는1200nit를 구현한다고 강조했다. BOE CEO가 “8K TV 시장을 선도하겠다”고 강조했다. 중국의 TFT-LCD 업체 BOE가 TV 분야에서 8K 시장을 선도하겠다는 야심을 내보였다. OLEDNET이 다녀온 26회 ‘파인테크 재팬’에서 열린 기술 컨퍼런스에서 BOE의 짜오홍 짱(Zhaohong Zhang) CEO는 “Strategy of Adaptation & Innovation”이라는 제목의 기조연설을 통해 “대화면 TV 시장이 크게 성장할 것이며 BOE는 대화면 8K TV 시장을 선도하겠다”고 강조했다. 짜오홍 짱 CEO는 전세계 디스플레이 시장은 ‘대형화’가 성장동력이 될 것으로 내다봤다. 이에 따라 모니터, TV 등의 대형화가 확산될 것이라는 게 그의 설명이다. 짜오홍 짱 CEO는 “디스플레이 시장은 고성장을 이루기 어려울 것이며 대형화가 진행돼 모바일은 FHD 400ppi 이상, TV는 UHD 4K 이상의 제품이 확산될 것”이라고 설명했다. 그는 “BOE는 ‘스케일’을 장점으로 시장에서 기회를 얻고 가치혁신을 통해 승자가 됐다”고 강조하며 대화면 TV 시장을 이끌겠다는 의지를 확고히 했다. 짜오홍 짱 CEO는 BOE의 혁신 방향으로 ▲Picture ▲Power ▲Health ▲Price ▲Panel ▲Pilot 등의 키워드를 제시했다. 특히 대화면 디스플레이 부문에서 승부수를 띄운다는 방침이다. 스마트폰, 태블릿 부문은 UHD 4K화질의 디스플레이를 내세우고 TV 부문에서는 8K 시대를 이끌겠다는 게 짜오홍 CEO의 계획이다. 그는 “2018년부터 대화면 8K TV 시장이 급속히 성장할 것으로 예상됨에 따라 BOE는 8K 기술과 제품에서 선구자가 되겠다”고 강조했다. 향후 모든 TV용 패널 시리즈에 8K를 적용할 방침이다. 짜오홍 짱 CEO는 이와 함께 백플레인 TFT 반도체 및 고개구율(aperture ratio) 기술을 활용해 저전력을 구현한다는 전략이다. 또 눈의 피로를 낮추고 색을 보정하는 디스플레이를 개발함으로써 사용자의 건강까지 생각한다는 점을 강조했다. 그는 “BOE는 앞으로 자동차, 의료, 증강현실(AR), 가상현실(VR) 등 새로운 애플리케이션 분야로의 진출을 위해 고해상도 구현, 터치 모듈 개발, 플렉서블 패널 개발 등을 진행할 것”이라고 밝혔다. 한편 올해로 26회째를 맞는 ‘파인테크 재팬’은 4월 6일부터 8일까지 도쿄 빅사이트에서 진행된 디스플레이 기술 관련 전시회다. 이번 행사에서는 SDC, LGD, BOE, JDI, JOLED 등 약 260여 업체가 참여했다. 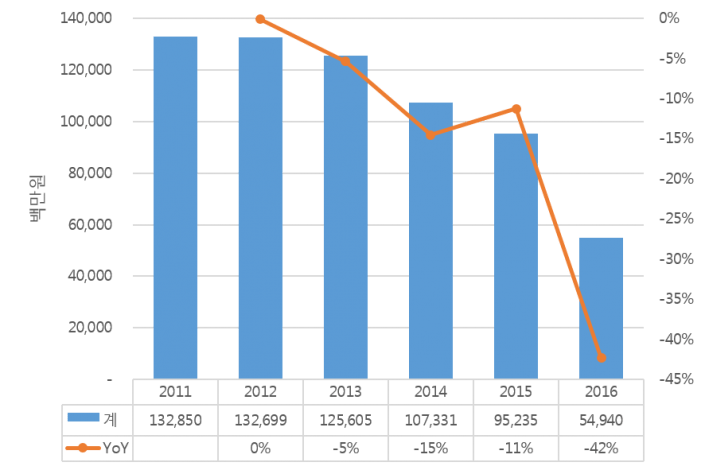 Due to the oversupply of LCD panel in global display market, the opinion that Samsung Display and LG Display will also not be able to avoid large amount of deficit is becoming stronger. 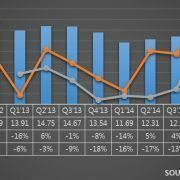 As of March 28, according to market experts including securities industry, Samsung Display and LG display will both face sizable deficit in LCD sector this quarter. For Samsung Display, Q1 LCD sector is expected to record up to 900,000 million KRW. 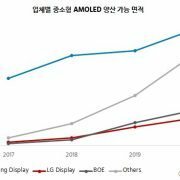 The company is estimated to reduce the overall display industry deficit with the OLED profit of approximately 400,000 million – 500,000 million KRW. Consequently, Samsung Display is to record approximately 400,000 million – 500,000 million KRW of deficit in Q1 2016. LG Display, whose over 90% of the current production line is for LCD, is estimated to be hit more directly. 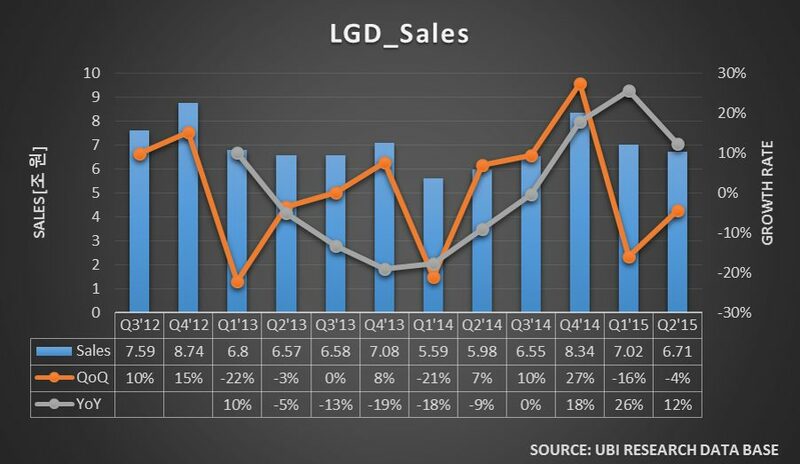 LG Display has been showing profit in LCD until 2015, but is expected to turn to deficit in Q1 2016. 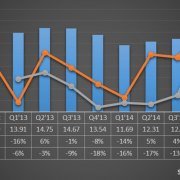 LG Display has been showing deficit in OLED, and market experts are also expecting more deficit in Q1 2016. The main reasons that display industry is having difficulty include oversupply of Chinese LCD, and overall market depression. Chinese companies’ affordable LCD supply, backed by active support of Chinese government, is damaging Korean companies. Particularly, companies such as BOE, which greatly improved productivity with much assistance from Chinese government including corporate tax exemption, have been pressuring Samsung, LG, and others in the global LCD market. 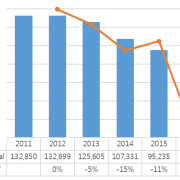 As the Chinese companies are still aggressively investing in LCD facilities, the LCD oversupply is analyzed to continue until 2018. Accordingly, the majority of the industry believe that both Samsung Display and LG Display will carry out LCD production line restructuring. 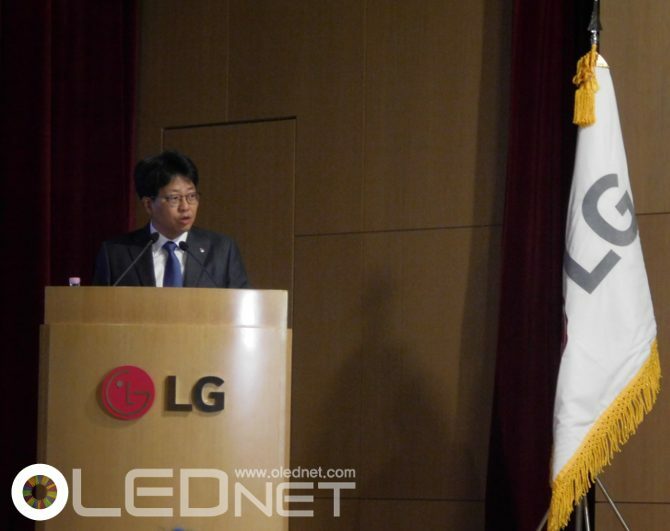 In a recent conference hosted by information company IHS, senior analyst Jeong Du Kang revealed that LG Display could restructure Gumi’s P2, 3, 4 production lines, and added that some thinks L6 production could stop following the same of L5 production line last year. As expected, both companies do not officially comment on these forecast. However, most of the industry players believe that the production line changes of the 2 companies are inevitable. One display expert explained that “unlike Samsung and LG which do not accept even small faults, Chinese companies are pouring out products with slightly lesser quality armed with lower price, and will dominate the mainstream market”. He also estimated that as Samsung and LG are nearing the situation where they have to give up LCD, the speed of which OLED will settle as the main player within the global display market will increase. Can Transparent OLED Be OLED Industry’s New Growth Engine? 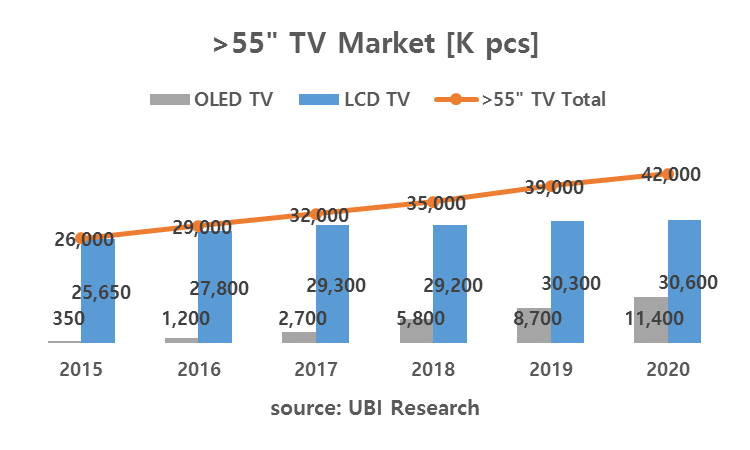 According to Transparent OLED Display Report 2016, published by UBI Research, large area transparent AMOLED market is expected to record approximately US$ 5,300 million by 2020. UBI Research revealed that “transparent OLED, with its high transmittance, is likely to be applied to transparent advertisement display such as showcases that has to properly actualize what is behind the display. Also, as the viewing angle is wide and color gamut and visibility are high, it will be widely used as transportation display such as automotive”. Furthermore, UBI Research added that as it is easy to produce flexible product and can be utilized in diverse applications that will be newly designed, market potential is very high. Transparent display is a display that can recognize/process/communicate information via optically transparent display using transparent electronic device. This is a device that is ordinarily transparent as glass and functions as monitor or TV as needed. As the area where the information is shown is transparent and objects behind the display can be seen, spatial/visual limitation can be overcome and diverse application and expansion of existing display market can be anticipated. Particularly, transparent OLED’s transmittance is approximately twice as high as transparent LCD (using the recently release panel), and simple to bend. As such, key panel companies are inclined to actively develop transparent OLED. In 2015, Samsung Display revealed world’s first 55 inch FHD transparent OLED with 45% transmittance and plan to mass produce from 2016. 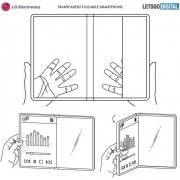 LG Display is also developing transparent OLED through project titled “60 inch or larger UD level transparent flexible display with transmittance of 40% or higher” that began in 2012. China’s BOE presented 9.55 inch transparent flexible OLED panel with 30% transmittance in SID 2015 and is actively carrying out research. From these companies’ transparent OLED development, transparent OLED is anticipated to play a big role in future display market expansion. 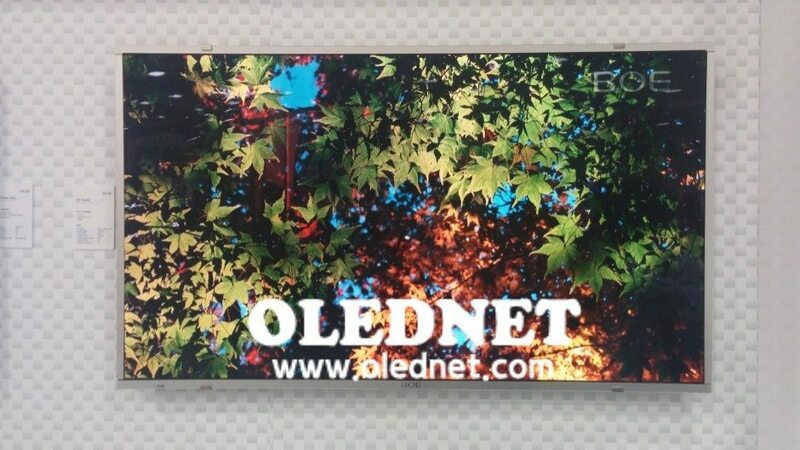 http://olednet.com/wp-content/uploads/2016/01/16_1_5_OLED.jpg 292 445 OLEDNET /wp-content/uploads/2015/09/logo_oled.png OLEDNET2016-01-06 09:13:082018-07-11 22:08:14Can Transparent OLED Be OLED Industry’s New Growth Engine? http://olednet.com/wp-content/uploads/2015/12/an030.jpg 705 940 OLEDNET /wp-content/uploads/2015/09/logo_oled.png OLEDNET2015-12-08 16:39:032018-07-11 22:11:08[2015 OLED Evaluation Seminar] Can LG Display and Samsung Display Become OLED Market’s Rule Maker? 12월 4일 유비산업리서치가 개최한 ‘2015 OLED 결산 세미나’에서 유비산업리서치의 이충훈 대표는 ‘AMOLED 패널 산업 동향과 시장 전망’이라는 강연을 통해 2015년까지의 OLED 산업을 정리하고 2016년 OLED 시장을 전망하는 시간을 가졌다. 이 대표는 플렉시블 OLED와 관련된 두 가지 이슈를 발표했다. 첫번째 이슈는 폴더블 디스플레이로 폴더블의 종류에는 안쪽에 디스플레이가 나오는 인폴딩과 바깥쪽에 디스플레이가 나오는 아웃폴딩 방식이 있다고 밝히며 현재 주력으로 개발하고 있는 방식은 인폴딩 방식이라고 발표했다. 또한 이런 기술들이 앞으로 ‘FinTech(Financial과 technology의 합성어. 모바일, SNS, 빅데이터 등의 첨단 기술을 활용해 기존 금융 기법과 차별화 된 새로운 형태의 금융기술을 의미한다. )’ 에 유용하게 쓰일 것이라고 전망했다. 플렉시블 디스플레이의 또 다른 이슈로는 필름 적용이라고 밝혔다. 플렉시블 디스플레이의 수율을 올리기 위해서는 커버글래스를 빼고 대신 필름을 깔아야 하지만 이 경우 터치 촉감이 안 좋아질 수 있기 때문에 촉감을 높이기 위해 폴리싱 등의 기술이 적용되어야지 소비자들의 마음을 얻을 수 있다고 강조했다. 시장과 관련해서 이 대표는 2020년까지 전 세계 스마트폰 시장이 약 2,000M대까지 성장할 것이며 이 중 삼성전자는 약 400M를 차지할 전망이라고 밝혔다. 또한 갤럭시 시리즈에 적용되는 디스플레이 중 OLED의 비중은 점점 늘어나 2019년에는 대부분의 galaxy 제품이 AMOLED panel을 탑재할 것 예상했다. 이 중 플렉시블 OLED는 약 280M, rigid OLED는 약 120M가 될 것이라고 전망하였다. OLED TV 시장도 2020년까지 약 1,100만대 규모로 성장할 것으로 예상되어 재료나 장비 시장이 폭발적으로 성장할 것이라고 예상했다. 현재 디스플레이 시장은 저성장 국면에 접어들고 있어 각 업체들은 신기술 개발과 생산성 증대를 통해 시장 경쟁력 강화에 총력을 기울이고 있다. 삼성 디스플레이는 본격적으로 OLED 패널에 대한 외부 업체 공급 활성화에 나서고 있으며, LG디스플레이는 세계 최대 규모로 OLED 중심의 P10 공장 건설 등에 총 1조 8,400억원 규모의 투자를 결정했다고 밝혔다. 이 대표는 플렉시블 OLED가 발전할수록 현재 모바일 디스플레이의 해상도 경쟁은 자연스럽게 없어지게 될 것이라고 전망하며, LTPS-LCD 시장이 축소되어 관련 패널 업체인 BOE와 Sharp, JDI, LGD의 매출이 줄어들 것이라고 예상했다. 또한 삼성전자도 2018년부터 OLED TV 판매를 시작할 것으로 전망하며 삼성전자에 LCD 패널을 공급하던 Sharp와 AUO, CSOT 매출이 줄어들 것이라고 밝혔다. 결론적으로 OLED 시장이 커질수록 기존에 LCD를 취급하던 업체들의 입지가 약화될 것이고 OLED 패널 생산과 관련된 업체들의 입지가 크게 강화될 것으로 전망했다. 이와 관련하여 한국 디스플레이 패널 업체가 앞으로 어떻게 될 것인지에 대한 질문에 이 대표는 LCD와 OLED가 시장을 주도하였을 때는 set업체들이 시장을 결정지었지만 OLED가 시장을 통합하게 된다면 디스플레이 패널 업체가 ‘Rule Maker’로 거듭날 것이라고 강조하며 그 중심에는 LG 디스플레이와 삼성 디스플레이가 있을 것으로 전망했다. 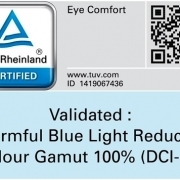 http://olednet.com/wp-content/uploads/2015/12/an030.jpg 705 940 OLEDNET /wp-content/uploads/2015/09/logo_oled.png OLEDNET2015-12-08 09:37:592018-07-11 22:11:13[2015 OLED 결산 세미나] LG 디스플레이와 삼성 디스플레이, OLED 시장의 ‘Rule Maker’로 거듭날까? 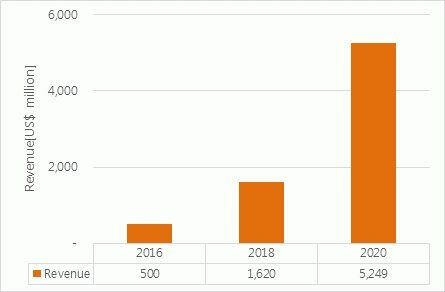 The last 5 years of budget for Korean semiconductor, which is a key industry for the nation, and display related industry’s original technology development expenses was researched and analyzed. Electronic information device sector’s expenses can be categorized into semiconductor, display, LED/lighting, and evaluation maintenance fee. In 2011, 130,000 million KRW was provided as technology development expense, but since then the amount annually decreased. In 2015, the amount was 95,000 million KRW, but in 2016, it is estimated to decrease further 42% and only 55,000 million KRW is expected to be provided. 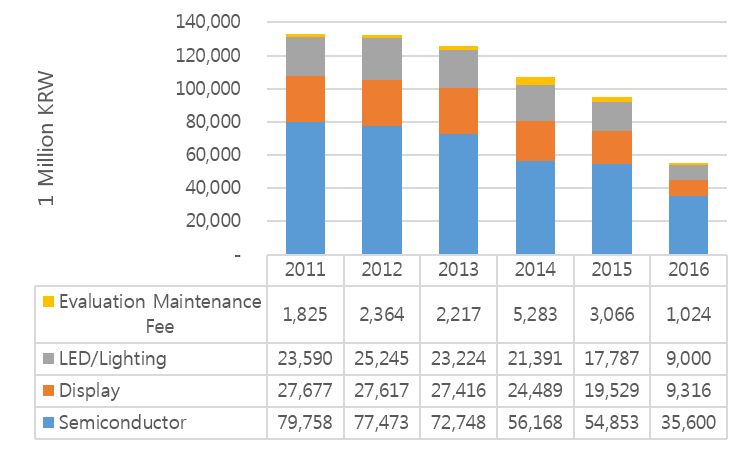 Semiconductor funding for 2015 occupies 58% of the total budget with 54,800 million KRW. Although that amount will be reduced to 35,600 million KRW in 2016, it is expected to occupy 65% of the total funding. For display section, the 2015 funding is only 19,500 million KRW, a 21% of the total budge. In 2016, this is estimated to fall to 17%. The government funding for display sector, which is the core of Korean electronic information industry, is around the same level as LED/Lighting sector. The rapid reduction of government funding for display industry is expected to cause much difficulty in future display business. The Korean display panel market that is being maintained by 2 companies, Samsung Display and LG Display, recorded 62 billion KRW in 2012. However, it fell to 52 billion KRW in 2014, and the market power is gradually weakening. As Chinese companies are becoming more active in LCD market, Korean companies’ price competitiveness is waning in low-priced panel market. If BOE’s Gen10.5 line begins operation in 2018, Korean display companies’ market power is analyzed to rapidly fall in LCD market. In order for the Korean display business to take-off again, now is the time for the government to fund OLED panel which has high added value. 대한민국 핵심 산업인 반도체와 디스플레이 관련 산업부의 산업원천 기술 개발 사업비의 최근 5년간 예산 현황을 조사하여 분석하였다. 전자 정보 디바이스 분야에는 반도체와 디스플레이, LED/광, 평가관리비로 구성되어 있다. 2011년에는 1,300억 원의 기술 개발 사업비 지원이 있었으나 해마다 금액이 감소하여 2015년은 950억이 되었으나 2016년은 2015년 대비 42% 줄은 550억 원에 불과할 예정이다. 2015년 반도체분야 지원금액은 총 548억원으로 전체 예산 950억원의 58%를 차지하고 있으며2016년은 356억원으로 줄어드나 전체 지원금액 중 65%를 차지할 예정이다. 디스플레이 분야의 2015년 지원 금액은 195억원으로 21%에 불과하다. 2016년에는17%로하락할예정이다. 한국 전자정보산업의 핵심인 디스플레이 분야의 정부지원금액은 LED/광과 유사하게 유지되고 있다. 디스플레이산업에 대한 정부지원금액이 현격히 줄어들고 있어 차기 디스플레이 사업에 막대한 지장을 초래할 것으로 예상된다. 삼성디스플레이와 LG디스플레이 2사로 유지되고 있는 한국 디스플레이 패널 시장은 2012년 62조원을 형성하였으나 2014년에는 52조원으로 하락하며 점차 시장지배력이 약화되고 있다. LCD시장에 중국기업들의 진출이 활발해짐에 따라 저가형 패널 시장에서 한국기업들의 가격경쟁력이 약화되고 있기 때문이다. 2018년 BOE의 Gen10.5라인 가동이 시작되면 LCD시장에서는 한국 디스플레이 기업들의 시장지배력이 급격히 하락할 것으로 분석된다. 한국 디스플레이 산업이 다시 도약하기 위해서는 부가가치가 높은 OLED패널 개발에 정부의 지원이 절실한 시점이다. 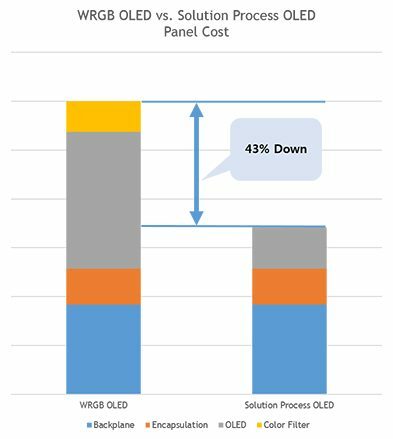 According to 2015 Solution Process OLED Report, published by UBI Research on October 14, solution process technology could produce 55inch OLED panel at approximately 43% cheaper cost compared to WRGB method. The report added that this value is the result of analysis of 2015 Q2 55inch UHD OLED panel price and yield, which is slightly higher than current production price of 55inch UHD LCD panel. However, considering that the solution process OLED structure will become simplified and that yield of backplane and encapsulation can be improved, the OLED panels will be able to be produced at lower cost than LCD panel. The report also revealed that solution process OLED can be an alternative solution for large area OLED panel in achieving price competitiveness. Solution process is a technology that can produce large area RGB pixel OLED panel using Gen8, or higher, equipment without cutting the mother glass. Key AMOLED panel companies are active in developing this technology. However, as solvent is used in order to turn the existing evaporation material into ink, its purity is decreased leading to lower emitting efficiency and therefore lower lifetime. Despite these factors, key panel companies’ enthusiasm for solution process technology is due to the high emitting material usage efficiency without using color filter, and simple structure compared to WRGB OLED panel which leads to production cost decrease. Panasonic has been most active in developing solution process applied OLED panel, and has presented several times in CES and IFA. BOE and AUO also have revealed solution process OLED panel produced via ink-jet manufacturing equipment, and CSOT is considering solution process development. Samsung Display and LG Display, leaders of AMOLED industry, are also actively developing the technology. 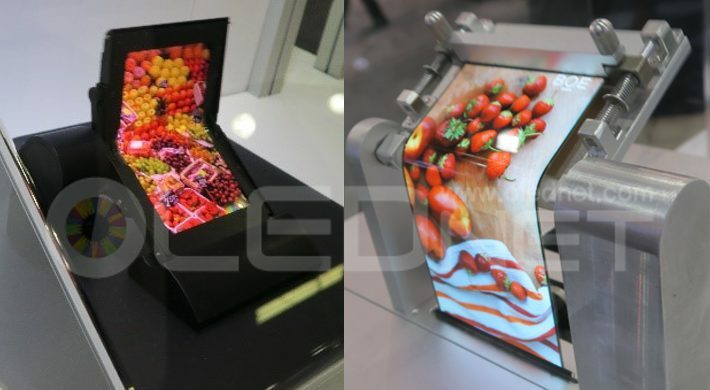 LG Display has adopted Gen8 ink-jet manufacturing equipment, and Samsung Display has started solution process OLED panel development with a focus on ink-jet manufacturing equipment companies. Material and manufacturing equipment companies as well as panel companies are leading the solution process technology development and commercialization. Kateeva agreed on technology collaboration with Sumitomo Chem. while Merck did the same with Seiko Epson. DuPont recently revealed that they enlarged solution process OLED material production facilities and began operation. Following these participation by key panel, material, and manufacturing equipment companies in solution process technology development and commercialization, it is anticipated that the solution process OLED panel market will record rapid growth. 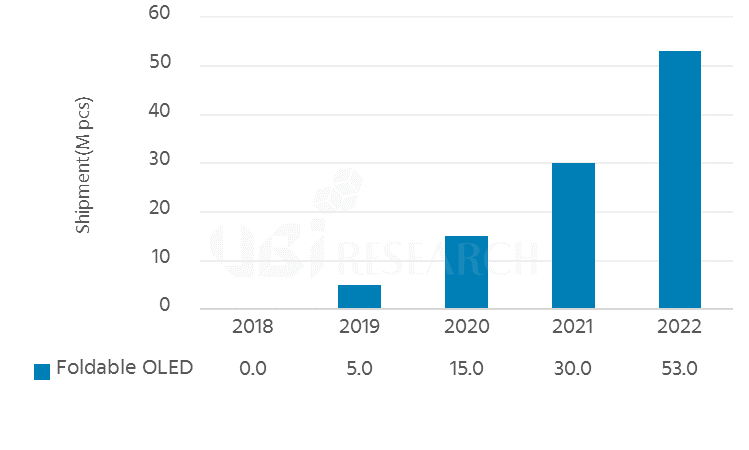 UBI Research’s 2015 Solution Process OLED Report forecast that solution process OLED panel market will actively begin mass production from 2018 and show approximately US$ 2,329 million in 2020. 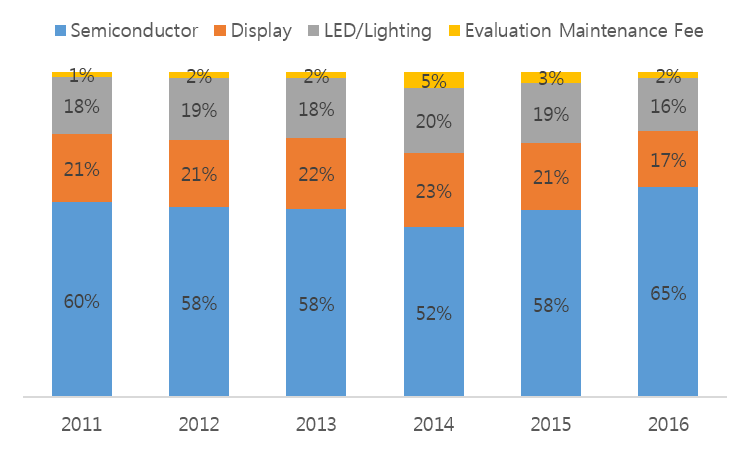 The analysis of 2015 2Q results of Samsung Display and LG Display shows clear indication that Korean display industry is on descent. According to the results announcement of the 2 companies, the total of 2015 Q2 sales is approximately US$ 11,000,000,000. 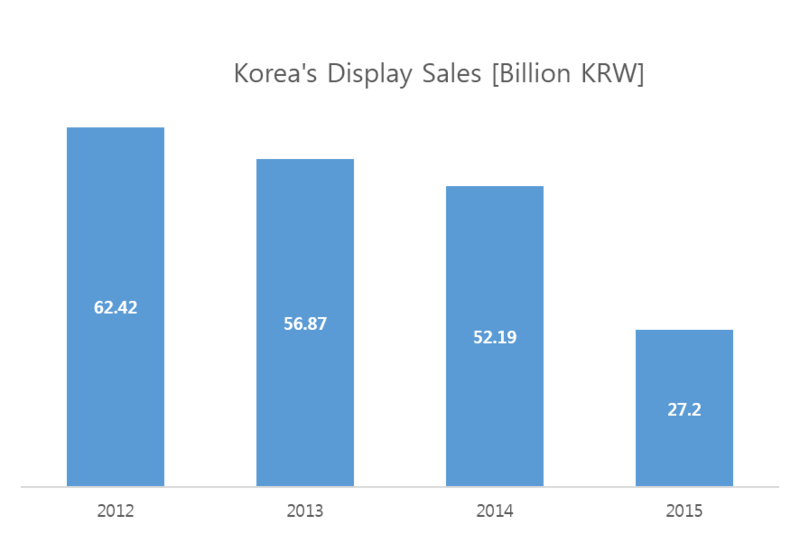 Compared to the total sales in 2013 Q2 which was US$ 13,000,000,000, Korean display industry trend is exhibiting clear downward tendency. 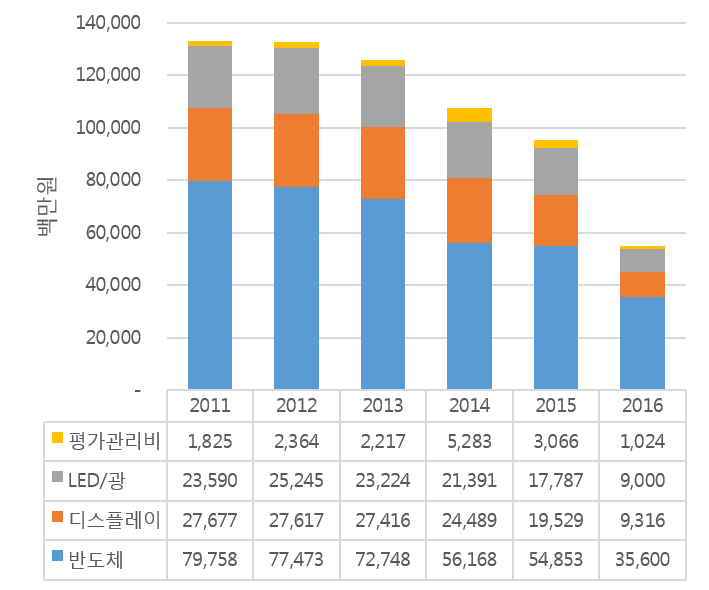 2015 Q2 Korean display sales records -4% QoQ, and 8% YoY. 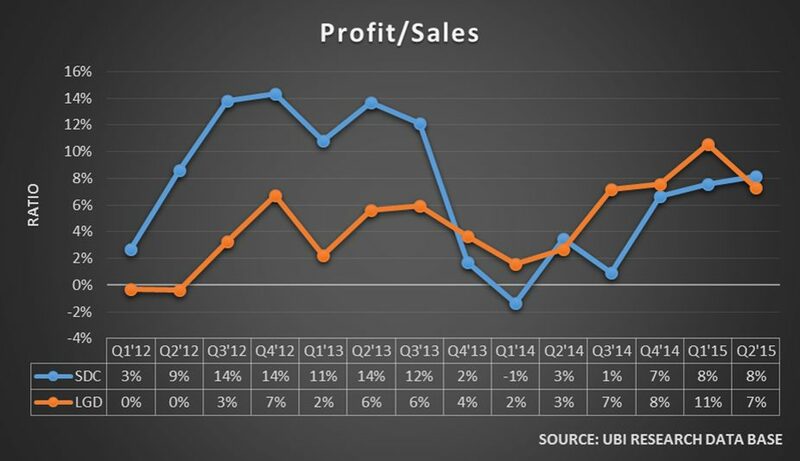 The main reason for the decrease in sales is Samsung Display’s deterioration of earnings results. 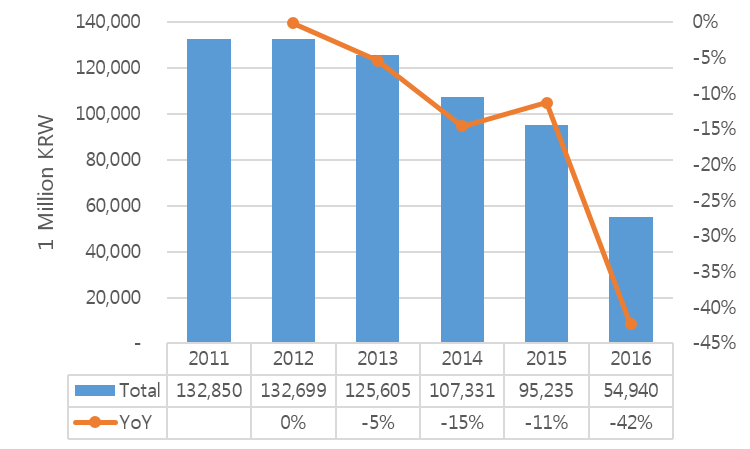 While LG Display’s sales of the past 3 years remain fairly consistent but Samsung Display’s sales is gradually decreasing. Connecting the high points of the total of 2 companies’ business profit reveal that the business value is worsening as the trend moves downward. This also is much contributed to Samsung Display’s business profit decrease. According to the earnings announcement of both companies, Samsung Display and LG Display recorded sales of approximately US$ 5,500,000,000 and US$ 5,600,000,000 respectively. 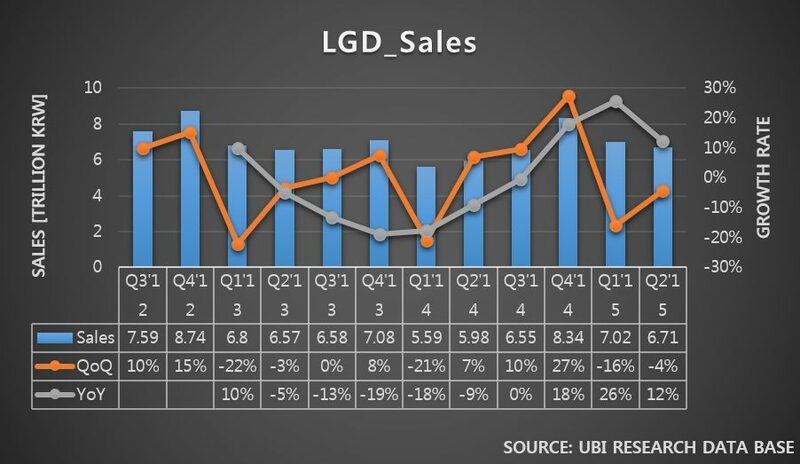 LG Display is maintaining higher sales results compared to Samsung Display for the past 5 quarters. Each company’s QoQ showed to be -4% (LGD) and -3% (SDC) and YoY to be 12% (LGD) and 5% (SDC). 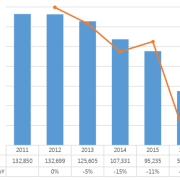 The simultaneous decrease of QoQ sales of both companies demonstrates that the Q3 sales could also fall. 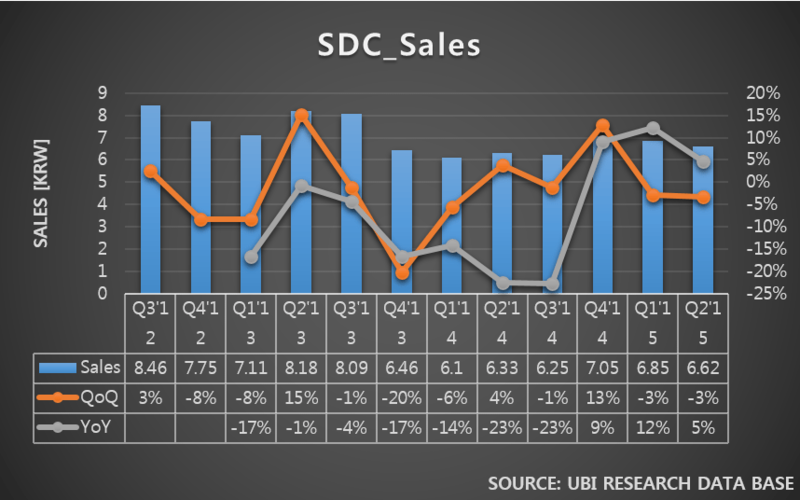 Looking at the profit/sales graph of Samsung Display and LG Display, it is apparent that Samsung Display showed superior competitiveness until 2013 Q3, but since then LG Display averaged higher. The reason for the downward trend of Korean display industry is analyzed to be the fall of display panel price due to the Chinse display companies’ mass production through aggressive investment. Particularly, in or after 2017 when China’s BOE is estimated to begin Gen10.5 LCD line, LCD panel price will fall even more rapidly. This is forecast to lead Korean LCD industry to suddenly lose competitiveness. For Korean display companies that have immense LCD sales to show positive growth, it is time to expand OLED business that can be differentiated from Chinse display companies. The only solutions for Korean display industry are OLED investment in large scale and conversion of LCD line to OLED line. At the time of BOE’s Gen10.5 line operation, Korean display companies also should respond with Gen6 flexible OLED investment and early establishment of Gen8 OLED line. At the 10th National Research Development Industry General Workshop in Display (8-10 July) in Muju, South Korea, industry-academy experts gathered and held a discussion on the future display strategy under the heading ‘Korean Display Industry Crisis, What is the Solution?’. At the previous keynote speech, vice president of LG Display, Yoon Sooyoung explained that the key points for the third revolution will be design innovation, design freedom differentiated though real image, and picture quality that can closely resemble visual reality. 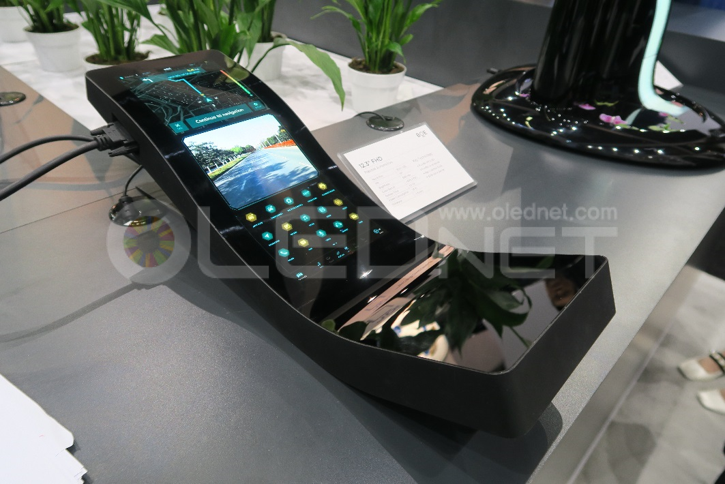 He also added that the third display is OLED that can actualize various advantages such as transparency, flexibility, and high picture quality at once, and considering material/component and mass production technology status, OLED will also be able to achieve competitive prices soon. Samsung Display’s executive director Hye Yong Chu forecast next generation display will be smart display, human friendly, holographic, and disruptive innovation. Particularly she estimated that thorough size and design innovation, flexible display will be able to create new application and market and that flexible OLED will form the core. The shared opinion of Samsung Display and LG Display, key Korean display companies, at the keynote session was Korean display industry’s need to lead the next generation display market in order to prepare for China’s pursuit and requirement of active participation and cooperation from industry-academy to achieve this. During the panel discussion that followed the keynote session, many different opinions were suggested regarding Korean display industry status from academy-industry. Of China’s BOE’s Gen10.5 investment, Samsung Display’s Chu disclosed that investment at the right moment was more important than preemptive investment; the focus will be curved and edge display market expansion and widening the technology gap with latecomers, and investment will be carefully considered before making a decision. 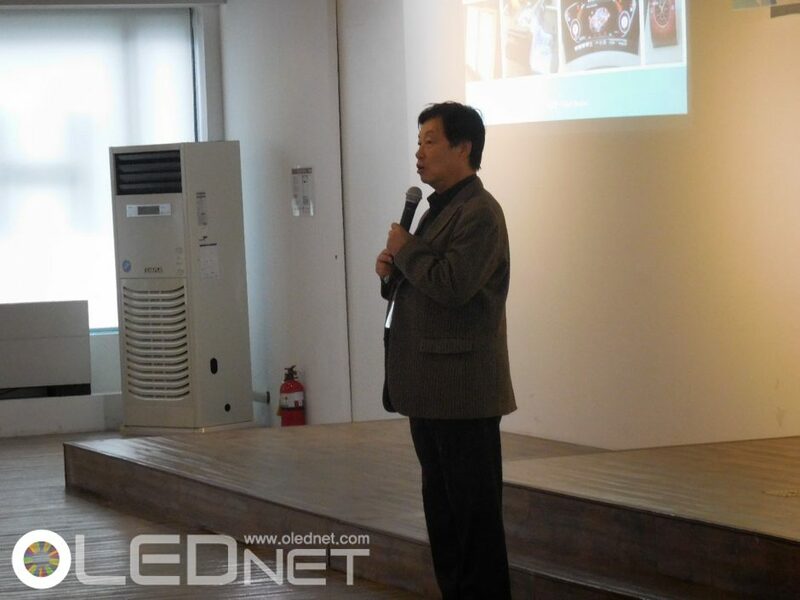 LG Display’s Yoon also explained that areas where cost innovation are possible are limited even with investment is carried out as the current display market is different from previous ones. He added that Gen10.5 investment has to be deliberated and emphasized that focus should be on how to make OLED competitive. Against the China’s aggressive investment on Gen8 or higher, Samsung Display and LG Display’s positions are analyzed to be of same opinion of carefully considering investment while pioneering the market maximizing the existing technology prowess. http://olednet.com/wp-content/uploads/2015/07/미래-디스플레이-전략-대토론회.png 705 940 OLEDNET /wp-content/uploads/2015/09/logo_oled.png OLEDNET2015-07-09 17:13:312018-07-11 22:26:32China’s Gen10.5 Investment, Korean Display Companies’ Countermeasure? 7월 8일부터 10일까지 무주에서 개최되는 제 10회 디스플레이 총괄 워크샵에서 산학연의 전문가들이 모여 “한국 디스플레이산업의 위기, 그 해법은?”이라는 주제로 미래 디스플레이 전략 대토론회를 가졌다. 앞선 기조연설에서 LG Display 윤수영 상무는 “Display의 세번째 혁명에는 design innovation과 real image로 기존과 차별화된 디자인 자유도와 눈으로 보는 것과 가장 근접하게 표현할 수 있는 화질이 핵심이 될 것”이라며 “제 3의 display는 투명과 flexible, 고화질 등 다양한 장점을 한번에 구현 할 수 있는 OLED이며, 소재/부품과 양산 기술의 진행상황을 고려했을 때 조만간 가격 경쟁력도 갖출 수 있을 것”이라 발표했다. Samsung Display의 추혜용 전무는 “차세대 display는 smart display, human friendly, Holographic, disruptive innovation등이 될 것”으로 전망하였으며, 특히 “Flexible display는 size와 design innovation을 통해 새로운 application과 시장을 창출할 수 있으며 flexible OLED가 핵심이 될 것”으로 내다 봤다. 이번 기조연설에서 한국 display 산업의 핵심 업체인 Samsung Display와 LG Display의 공통 의견은 중국의 추격에 대비하기 위해서는 차세대 디스플레이 시장을 주도 해야 하며 그러기 위해서는 산학연의 적극적인 참여와 co-work이 필요하다는 것이었다. 기조연설에 이어 진행된 패널 토론회에서는 최근 핫 이슈인 산학연의 입장에서 한국 display산업의 현 상황에 대한 다양한 의견들이 제시되었다. 특히 중국 BOE의 10.5세대 투자와 관련하여 Samsung Display의 추전무는 “지금 산업에서는 선제투자보다는 적기투자가 더욱 중요하다며, curved와 edge display의 시장 확대와 후발업체들과의 기술격차를 벌리는 것에 초점을 맞추되 투자는 신중히 결정할 것”이라 밝혔다. 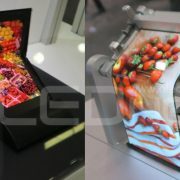 LG Display의 윤상무도 “현재 display 시장은 예전시장과 다르기 때문에 투자를 진행한다 해도 cost 혁신을 이룰 수 있는 부분이 제한적이다. Gen10.5에 대한 투자는 신중해야 한다”며 “OLED로서 경쟁력을 갖추기 위해 집중할 것”이라 강조하였다. 중국의 8세대 이상의 공격적인 투자에 맞서 한국의 양대 산맥인 Samsung Display와 LG Display의 입장은 투자에는 신중하되 현재 가지고 있는 기술력을 최대한 개발/활용하여 시장을 개척한다는 공통적인 입장으로 풀이된다. 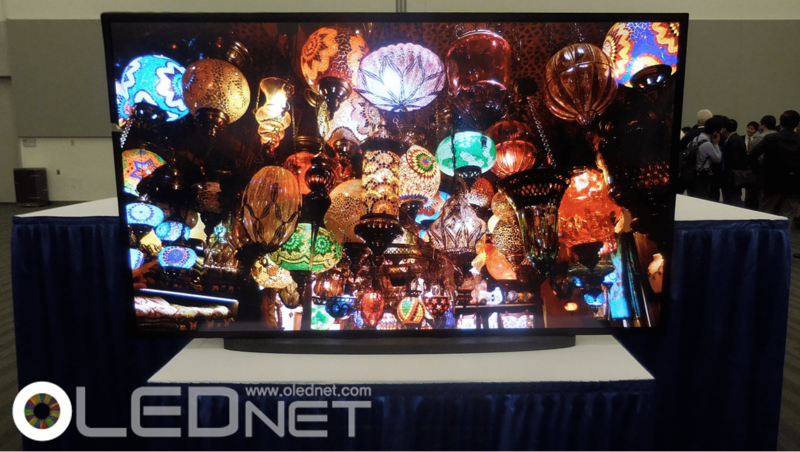 http://olednet.com/wp-content/uploads/2015/07/15_07_09.jpg 510 680 OLEDNET /wp-content/uploads/2015/09/logo_oled.png OLEDNET2015-07-09 11:06:302018-07-11 22:26:37중국의 10.5세대 투자, 한국 display업체 대응책은? OLED TV 산업은 지금까지 한국 기업들이 이끌어 왔다. 미국 산호세에서 열린 SID 2015 (5/31~6/5) 전까지는 LG디스플레이와 삼성디스플레이가 4K OLED 패널을 공개한 유일한 패널업체였고, 현재까지 OLED TV를 대량으로 판매하는 업체는 LG전자가 유일하다. 그 동안, TV 시장에서는 OLED가 LCD보다 명암비와, 시야각, 응답속도, 두께에 관하여 우월하나 비교적 높은 가격으로 인해 시장점유율이 제한되었다. 하지만, 이제 이는 곧 달라질 것으로 예상된다. 그 동안, LG전자는 OLED TV 동맹으로 중국, 일본 업체들과의 협력을 추진해 왔다. 그 결과 중국과 일본 업체들은 2015년 하반기부터 OLED TV 시장에 뛰어들기로 하였다. 일본의 파나소닉과 소니는 올해 하반기에 OLED TV를 처음으로 출시할 예정이며, 중국의 스카이워스와, 창훙, 콩카, 하이센스는 이번 가을부터 판매를 시작할 계획이다. 결과적으로 2015년 말까지 4K OLED TV를 생산하는 세트업체는 7개로 늘어난다. 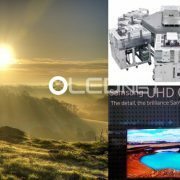 4K 해상도의 OLED 패널을 대량 생산할 수 있는 유일한 업체인 LG디스플레이는 OLED TV 생산을 시작하는 세트업체들에 공급하기 위해 올 여름 생산량을 4배 증가시킬 예정이다. 위 언급한 내용과 같이, SID 2015까지 4K OLED 패널을 공개한 업체는 LG디스플레이와 삼성디스플레이가 유일했고, 이 두 업체 중 LG디스플레이만이 4K OLED 패널을 대량 생산 할 수 있다. OLED TV를 생산할 세트업체는 늘어나고 있지만 패널 공급업체는 LG디스플레이 한 곳으로서 장기적으로 봤을 때 추가적인 공급업체가 더 필요할 것으로 예상된다. 이번 SID 2015에서 AUO는 author interview 시간에 4K OLED 패널을 선보였고, CSOT와 BOE는 4K OLED 패널 관련 논문을 발표했다. 이는 AUO와 CSOT, BOE가 OLED 패널 제작에 필요한 기술을 보유하고 있다는 것을 나타내고 있으며, 적절한 시기에 투자가 이루어진다면 대량생산을 시작할 수 있다는 것을 의미한다. 따라서 앞으로 증가할 것으로 예상되는 OLED TV 수요에 맞춰 LG디스플레이뿐 아니라 후발 업체들 또한 OLED TV용 패널을 양산할 것으로 기대되어 OLED 패널과 OLED TV 출하량 증가에 기여할 것으로 전망된다. 이러한 발전은 소비자에게는 낮은 가격으로 연결될 것이고 OLED TV 시장은 활성화 될 것이다. LCD technology of Chinese companies is continually evolving. 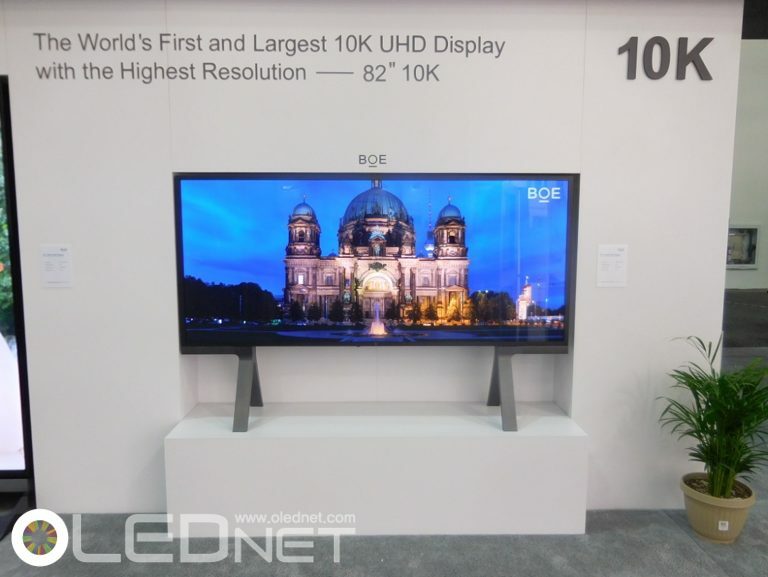 In SID 2015, BOE exhibited world’s largest 110inch 8K and world’s first 82inch 10K LCD panels. CSOT drew much attention with its world’s largest 110inch UHD curved LCD TV. By exhibiting ultra high resolution and large size LCD panel ahead of Korean and Japanese panel companies, CSOT aptly demonstrated that Chinese companies have caught up to Korean and Japanese technology skills. The current large area TV market is led by LCD and OLED is slowly expanding the market starting with premium TV. Even in premium market, with price competitiveness LCD is one step ahead with QD film applied LCD TV. Therefore, the technology development of LCD that is catching up to OLED’s advantages is expected to be a hurdle for OLED’s market opening. Although LCD’s color gamut, thickness, contrast ratio, and response time is being continually improved and can approach to OLED’s level but cannot be equal to OLED in all areas. For example, if the thickness is reduced in LCD, the QD film application needed for increased color gamut is difficult. Even if panel with many positive traits altogether is developed, it is expected to take much time giving OLED chance to drop the price to LCD level. Therefore, reducing OLED panel’s price by OLED’s active investment and yield achievement is analyzed to be an essential condition for next generation display leadership. 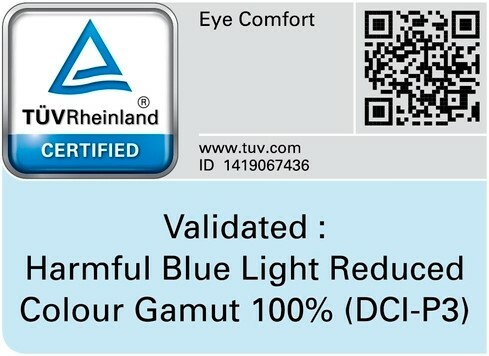 http://olednet.com/wp-content/uploads/2015/06/an079.jpg 571 762 OLEDNET /wp-content/uploads/2015/09/logo_oled.png OLEDNET2015-06-07 00:04:432018-07-11 22:30:06[SID 2015] Chinese LCD’s Continuous Evolution. OLED, What To Do? 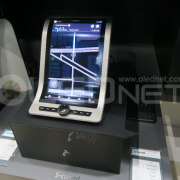 [SID 2015] 중국 LCD의 거침없는 발전, OLED 어떡하나? 중국업체의 LCD의 기술력이 날로 발전하고 있다. 이번 SID 2015에서 BOE는 world largest 110inch 8K와 world first 82inch 10K 해상도의 LCD panel을 전시하였으며, CSOT는 world largest 110inch UHD curved LCD TV를 메인에 전시하여 관람객들의 큰 이목을 끌었다. 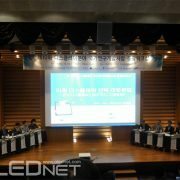 이는 한국과 일본 panel 업체들보다 한발 앞서 초고해상도와 대면적 LCD panel을 전시함으로써 더 이상 중국이 한국과 일본의 기술력을 충분히 따라잡았다는 것을 보여주기 충분했다. 또한 BOE는 색재현률 99%의 27inch QHD LCD panel을, CSOT는 118% 색재현률의 55inch UHD LCD panel을 전시하였으며 특히 CSOT는 4mm두께의 32inch FHD LCD TV와 5.5mm 두께의 4K curved LCD panel을 전시하여 OLED의 장점인 색재현율과 얇은 두께까지 LCD로서 따라잡을 수 있다는 것을 보여주었다. 이와 같이 LCD의 지속적인 신기술 개발과 가격경쟁력을 바탕으로 차세대 디스플레이를 놓고 OLED와의 주도권 싸움이 다시 한번 치열해 질 것으로 예상된다. 현재 대면적 TV 시장은 LCD가 주도하고 있으며 OLED가 서서히 프리미엄 TV 시장부터 시장을 확대해 나가고 있다. 프리미엄 시장에서도 LCD가 가격경쟁력을 바탕으로 QD film을 적용한 LCD TV로서 한발 앞서나가고 있는 상황이다. 따라서 이러한 LCD의 OLED의 장점을 따라잡는 개발이 앞으로의 OLED의 시장 개화에 걸림돌이 될 수 있을 것으로 예상된다. LCD는 색재현율과 두께, 명암비, 응답속도 등이 지속적으로 개선되고 OLED와 근접한 수준까지 개발될 수는 있지만 모든 면에서 OLED와 같을 수는 없다. 예를 들어 두께를 줄이게 되면 색재현율을 높이기 위해 QD film을 적용하기가 어렵다. 여러 장점이 동시에 개선된 panel이 개발된다 하더라고 많은 시간이 소요될 것으로 예상되며, 그 전에 먼저 OLED의 가격이 LCD 수준으로 낮아질 것으로 전망된다. 따라서 OLED의 적극적인 투자와 수율 확보로 panel 가격을 낮추는 것이 차세대 디스플레이시장을 주도하기 위한 필수 조건으로 판단된다. 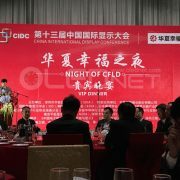 http://olednet.com/wp-content/uploads/2015/06/an079.jpg 571 762 OLEDNET /wp-content/uploads/2015/09/logo_oled.png OLEDNET2015-06-06 22:29:532018-07-11 22:30:24[SID 2015] 중국 LCD의 거침없는 발전, OLED 어떡하나? Truly’s OLED panel mass production is smoothly being carried out. According to OFweek, Zhang Jintao (Senior Manager of Truly) revealed on May 20 that ‘the construction of Phase I of the company’s AMOLED production plant will be completed in June, and the equipment will be installed in October’. He also added that the production line will begin operation in the first quarter of 2016 after passing through tests. Truly’s AMOLED project was approved by EIA (Energy Information Administration) in May 2014, and began line construction in July. The investment cost is approximately 63,000,000 yuan. For mass production, Truly purchased Samsung Display Gen4.5 line’s LTPS equipment, and ordered SFA’s evaporator. The total area of mass production line is 310,000m2, and total capa. is 30K. Mobile device AMOLED panel companies in China are Visionox, EverDisplay, Tianma, Truly, and BOE. Visionox and EverDisplay are in the process of mass production using evaporators of SNU Precision and ULVA respectively, and supplying panels to several companies. Tianma and BOE are aiming for mass production in the second quarter of 2015. At present, Samsung Display is occupying over 90% of total mobile device display market. However, as Chinese panel companies are expected to actively begin mobile device AMOLED panel mass production from 2016, it is estimated that there will be a significant change to the market flow. http://olednet.com/wp-content/uploads/2015/05/그림1.jpg 254 536 OLEDNET /wp-content/uploads/2015/09/logo_oled.png OLEDNET2015-05-28 18:32:332018-07-11 22:31:34Chinese Panel Company, Reborn as Center of Mobile Device Display Market? 중국 panel업체, mobile용 디스플레이 시장의 중심으로 거듭날까? Truly의 OLED panel 양산이 순조롭게 진행 중이다. OFweek에 따르면 5월 20일 Truly의 Zhang Jintao 주석은 “AMOLED panel 생산 라인의 Phase 1은 6월에 완공될 예정이며, 관련 장비는 10월에 설치될 계획이다. 양산 관련 테스트들을 통과한 후, 생산 라인은 2016년 1분기에 가동될 예정이다.” 라고 밝혔다. Truly는 2014년 5월에 EIA(Energy Information Administration)로부터 AMOLED project을 승인받았으며, 7월에 line 건설을 시작하였다. 투자비는 약 6,300만 위안이며, 양산을 위해 Samsung Display Gen4.5 line의 LTPS 장비를 구매하였고, SFA의 증착기를 발주하였다. 양산라인의 전체 면적은 310,000m2이며, 총 capa.는 30K이다. 중국의 mobile용 AMOLED panel업체는 Visionox와 EverDisplay, Tianma, Truly, BOE가 있다. Visionox와 EverDisplay는 각각 SNU Precision와 ULVAC의 생산용 증착 장비로 양산을 진행 중에 있으며, 현재 일부 업체에 panel을 공급하고 있는 것으로 나타났다. Tianma와 BOE는 2015년 2사분기 양산을 목표로 하고 있다. 현재 mobile용 디스플레이 시장은 삼성 디스플레이가 전체 시장의 90% 이상을 차지하고 있으나 2016년부터는 중국 panel업체들이 mobile용 AMOLED panel 양산을 본격적으로 시작될 것으로 전망되어 mobile용 AMOLED panel 시장 흐름에 큰 변화가 있을 것으로 예상된다. http://olednet.com/wp-content/uploads/2015/05/ccc006.gif 394 600 OLEDNET /wp-content/uploads/2015/09/logo_oled.png OLEDNET2015-05-28 10:04:362018-07-11 22:31:39중국 panel업체, mobile용 디스플레이 시장의 중심으로 거듭날까? Large size OLED panel is currently being mass produced by LG Display using WRGB method, and investment in this method for large size panel is being considered by OLED panel latecomers. Another method that can be used to produce OLED is RGB method. In 2013 Samsung Display mass produced using RGB method but halted the process due to problems in yield rate and technology. However, recently as key display companies are developing RGB method using solution process for large area OLED panel, latecomers are having to make a difficult choice in process selection. OLED specialized panel company JOLED, established by JDI, Sony, Panasonic, and Innovation Network Corporation of Japan (INCJ), is aiming for mid-to-large size OLED panel production using solution process. Additionally, other companies including AUO, BOE, LG Display, and Samsung Display are developing large size OLED panel using solution process technology. In 2013, AUO presented 65 inch FHD panel that used solution process technology, and BOE revealed 30.5 inch FHD panel. Panasonic also presented solution process applied 4K panel. According to 2015 White OLED Display Annual Report, published by UBI Research, WRGB method has an advantage in high mass production potential as open mask is used. However, due to the stack structure and color filter use, it has a disadvantage of increased panel production cost. On the other hand, the materials and process technology for solution process are not yet mature, but has the advantage of being able to produce large size OLED panel in Gen 8 size or larger without glass cutting using RGB method. It also can reduce the production cost as the material efficiency is high and does not require color filter. 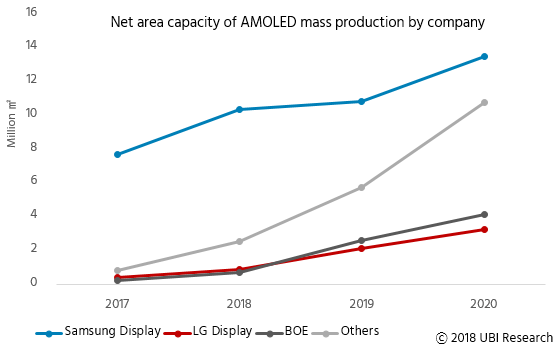 At present the mass produced glass area by the latecomers forecast to manufacture large area AMOLED panel is expected to occupy approximately 30% of the total large area OLED market in 2020, and latecomers’ choice in technology investment will be a key point. Therefore, the large area panel technology leadership will be decided on whether WRGB and solution process methods can solve the issues that each has. 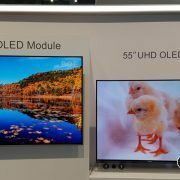 대면적 OLED panel은 현재 LG Display가 WRGB방식으로 양산 중이며, 후발 OLED 패널업체들도 대면적 패널에서 WRGB 방식으로의 투자를 검토 중에 있다. OLED를 제조할 수 있는 또 다른 방식에는 RGB 방식이 있다. 2013년 삼성 디스플레이에서 RGB 방식으로 양산을 진행했지만 수율과 기술적인 문제로 중단한 적이 있다. 하지만, 최근 주요 디스플레이 업체에서 solution process를 이용한 RGB 방식으로 대면적 OLED 패널의 개발을 진행하면서 후발 업체들에게 공정 방식 선택에 대한 고민을 안기고 있다. 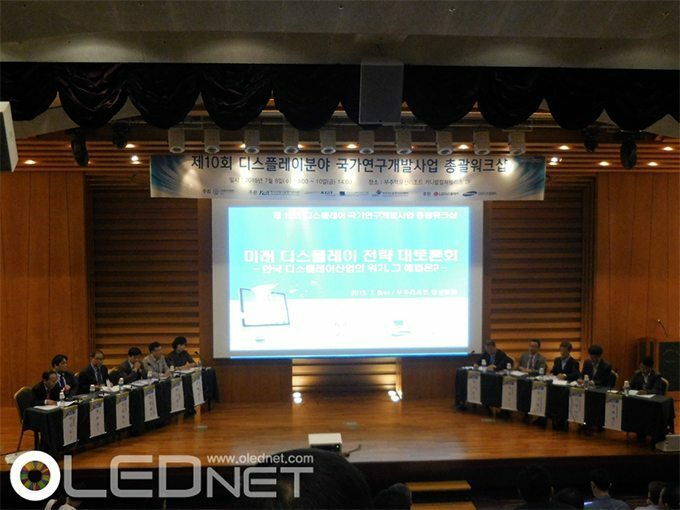 산업혁신기구(INCJ)와 JDI, Sony, Panasonic이 합작하여 설립한 OLED 전문 panel 업체인 JOLED는 solution process기술을 이용하여 중대형 OLED 패널을 생산하는 것을 목표로 하고 있다. 그 외에도, AUO, BOE, LG 디스플레이, 삼성 디스플레이 등이 solution process 기술을 이용한 대면적 OLED 패널을 개발하고 있다. AUO는 2013년 solution process 기술을 사용한 65인치 FHD 패널을 선보였으며, BOE도 30.5인치 FHD 패널을 공개하였다. 또한 Panasonic도 solution process를 사용한 4K 패널을 공개한 바 있다. 유비산업리서치에서 발간한 ‘2015 White OLED Display Annual Report’에 따르면 WRGB방식은 open mask를 사용하기 때문에 양산성이 높다는 장점이 있지만, 적층 구조과 color filter를 사용해서 패널 제조 원가가 상승하는 단점이 있다. 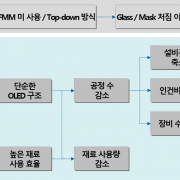 solution process는 재료와 공정 기술이 성숙되지 않았지만, RGB 방식으로서 Gen8이상의 size에서 glass cutting없이 대면적 OLED 패널을 제작할 수 있으며, 재료 효율이 높고 color filter를 사용하지 않기 때문에 패널 제조 원가를 줄일 수 있는 장점이 있다. 현재 대면적 AMOLED 패널을 생산할 것으로 예상되는 후발업체들의 양산 glass area은 2020년 전체 대면적 OLED 시장의 약 33%가 될 것으로 전망되어 후발업체들의 투자기술 선정이 관건이 될 전망이다. 따라서 WRGB와 solution process가 가지고 있는 각각의 이슈를 해결하느냐에 따라 앞으로 대면적 패널의 기술 주도권의 향방이 갈릴 것으로 예상된다. LG Display는4월 22일 여의도 트윈타워에서 열린 2015년 1분기 실적 설명회에서 OLED TV의 시장 진입에 대해 양산 수율과 시기, 경영이 적절하게 조화된 성공적인 진입이라고 밝히며 panel 생산 목표는 올해 60만대, 내년 150만대라고 밝혔다. 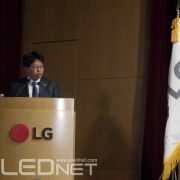 이날 실적 발표회에서 LG Display CFO 김상돈 전무는 “OLED TV는 작년까지는 기술의 혁신, 올해는 고객과 수율의 혁신으로 내년까지 대중화의 가능성이 있는지가 판가름 날 것”이라며, “당장의 이익을 추구하기 보다 사업가치를 올리는데 집중할 것으로, 대면적 디스플레이에서 구조의 차별화를 위해 OLED에 집중하는 전략을 차근차근 진행할 것”이라 말하였다. 또한 OLED TV시장의 성장성을 보고 추가 투자에 대한 결정을 할 것이라 밝혔다. 최근 이슈가 되었던 중국 BOE의 Gen10.5 투자와 관련해서는 “셋업에 들어가기 위한 시간이 상당히 많이 필요할 것으로, 중국 업체들이 대면적화를 진행하는 도중 어려움에 봉착되면 30inch 생산으로 돌아갈 것으로 예상된다. 따라서 LG Display의 대면적 panel 매출에 큰 영향을 끼치지는 않을 것”이라고 전망하였다. LG Display의 Gen10.5 대면적 LCD 투자에 대해서는 cost 문제와 시장 성숙도를 고려해서 신중한 결정할 예정이라 밝혔다. 한편 LG Display는 태블릿 등 중소형 디스플레이에서는 계절적 요인에 의한 매출 감소가 있었으나, 대면적 디스플레이에서는 실적 호조로 전체 영업이익은 전분기(6,260억원) 대비 11% 오른 7,440 억원으로 12분기 연속 영업이익 흑자를 기록했다고 발표하였다. 대면적 OLED TV생산은 디스플레이 시장의 뜨거운 감자들 중 하나로 보여지고 있다. 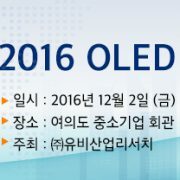 차세대 디스플레이로 OLED가 주목 받은 지 오랜 시간이 지났지만 여전히 시장에 OLED 디스플레이가 사용된 제품 보급률은 높지 않은 것으로 나타난다. 시장조사업체인 유비산업리서치 관계자에 따르면 OLED 패널의 생산 볼륨 및 그 사용의 범위는 지속적으로 증가하고 있지만 생산자 마켓에서 소비자 마켓으로 넘어오는 시점이 디스플레이 산업의 또 다른 도약이 될 것이라고 한다. 유비산업리서치가 2015년 4월 15일 발간한 White OLED Display 연간 보고서에 따르면 그 동안 사용되어 오던 RGB 구조를 사용한 OLED 패널은 대면적 디스플레이를 생산할 경우 쳐짐 현상으로부터 발생하는 Dead Space가 생김으로써 양산이 현실화 되지 못해왔다. 따라서 이와 같은 현상을 개선하기 위해서 추가되는 공정과 그에 따른 투자비용의 증가는 패널 원가를 상승시킴에 따라 시장 경쟁력을 저하시키는 결과를 야기하게 된다고 분석했다. 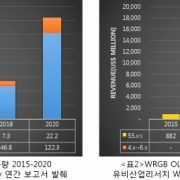 Solution Process 방식을 적용한 기술이 WRGB OLED의 뒤를 바짝 추격하며 개발되고 있지만 WRGB 구조가 가지는 효율성과 장점과 경쟁하며 본격적인 양산이 시작되기까지는 약 3-4년의 시간이 필요하다는 것이 유비산업리서치의 분석이다. WRGB OLED을 선택함으로써 RGB 구조가 가지는 대면적 패널 양산 한계점을 해결해 줄 수 있다면 앞으로 과연 OLED TV 생산은 본격화 될 것인가에 대한 전망이 기대되며 그 시점에 관한 논쟁은 이 보고서의 발간에 따라 한동안 이슈가 될 것으로 예상된다. 또한, 정말 WRGB OLED가 대면적 디스플레이 구현을 위한 유일한 기술이며, 그렇다면 WRGB OLED의 독보적인 행보는 언제까지 이어질 수 있을 것인가에 대한 분석이 요구된다. 한국기업들의 독점시장이라해도 과언이 아니었던 OLED 패널 시장에 중국업체들의 본격적인 생산이 예견됨에 따라 OLED 패널에 사용되는 발광재료시장에도 움직임이 시작되고 있다. 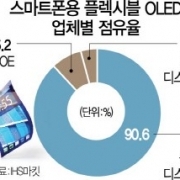 2015년 3월 발간된 유비산업리서치의 “’OLED Emitting Material Annual Report’’’는 2015년 2분기부터 중국업체들의 Mobile용 AMOLED 패널양산이 시작되며 대면적 패널은 2017년부터 시작될 것으로 전망했다. 중국의 패널 양산과 더불어 발광재료시장 규모는 2015년 전년대비 16% 상승한 $560 M에서 2020년 약 $2,500 M까지 상승할 것으로 내다보고 있다. 패널시장확대에 따른 국내 발광재료 업체들의 공급라인 확보를 위한 경쟁력강화가 요구되며 중국업체들의 패널시장 진출로 위협받는 국내 패널생산 기업들의 시장점유율 유지를 위한 기술력 확보가 요구되는 시점이다. 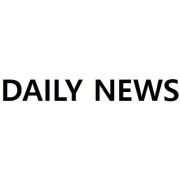 A Taiwanese IT medium, Digitimes, reported that Universal Display Corporation (UDC) had announced its expanded evaluation agreement for PHOLED material supply to BOE. 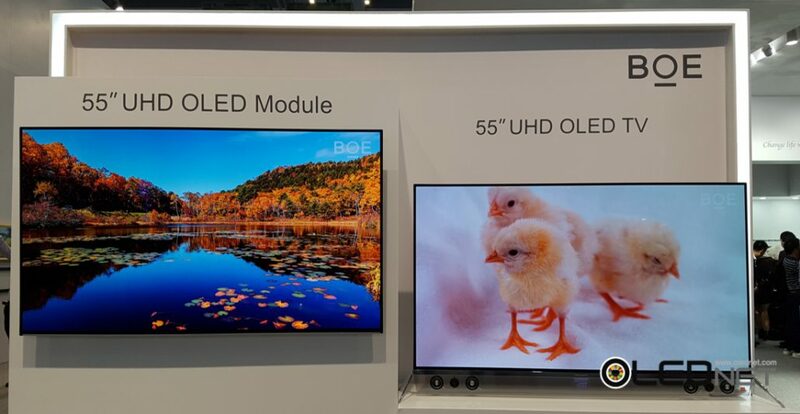 BOE is developing panels and modules for 55” AMOLED TV with oxide TFT and WRGB in Gen8 pilot line in Hefei, and displayed 55” FHD AMOLED panel at SID 2014. It also plans to mass-produce small and medium size AMOLED panel from the AMOLED line in Ordos in the latter half of this year. BOE expressed possibility of investing in TV following mobiles by displaying 55” FHD AMOLED panel. In terms of technology readiness level, it is incompatibly lower than panels of LGD and SDC though, it is considerably fast that it was developed in six months and produced in a pilot line in Hefei. AUO showed that its AMOLED technology had reached at certain level by unveiling 5.7” WQHD (513ppi) ultra-high resolution AMOLED panel. More attention drew towards AUO’s panel because its production method is RGB+FMM as SDC uses and the high resolution is realized with real RGB strip type rather pentile. AUO also expressed its will on AMOLED business by showing 5” HD flexible AMOLED panel and 1.6” AMOLED panel for a smart watch. 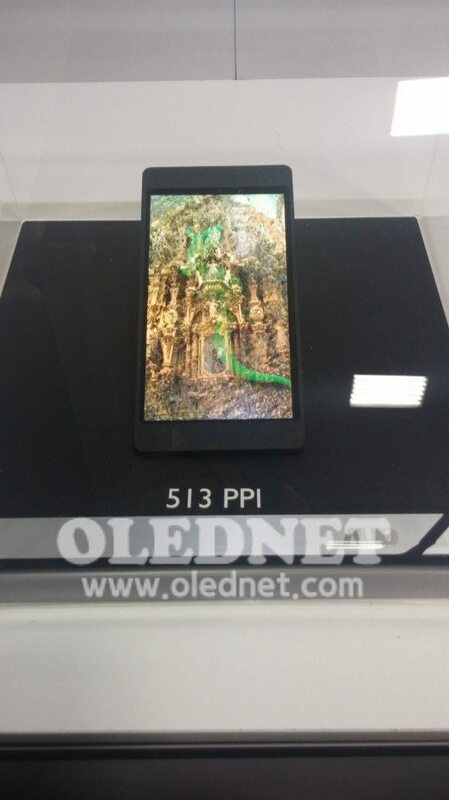 Tianma also unveiled 5.5” HD AMOLED panel. Its performance lags behind the current AMOLED panel, but it ai ms to supply middle-end and low-end panel targeting mass-production of 5.5” FHD AMOLED through continuous R&D. Challenges of Chinese and Taiwanese makers become serious in the AMOLED market, where Korean makers, SDC and LGD, are dominant, and the latecomers are about to invest in the sector. 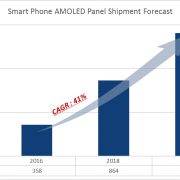 Thus, it is expected that the AMOLED industry will constantly grow.